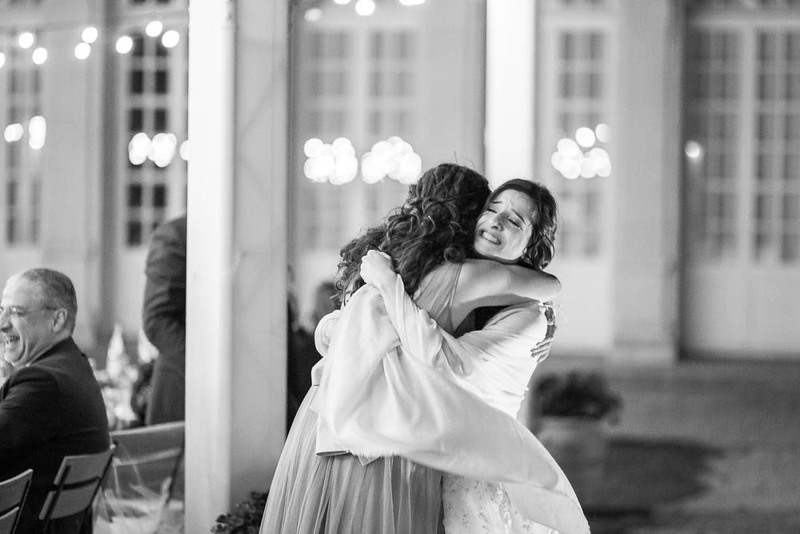 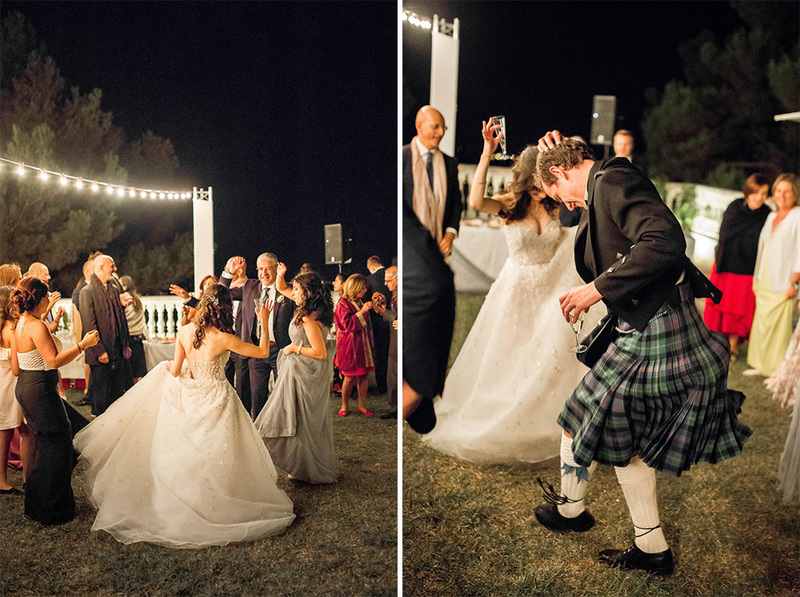 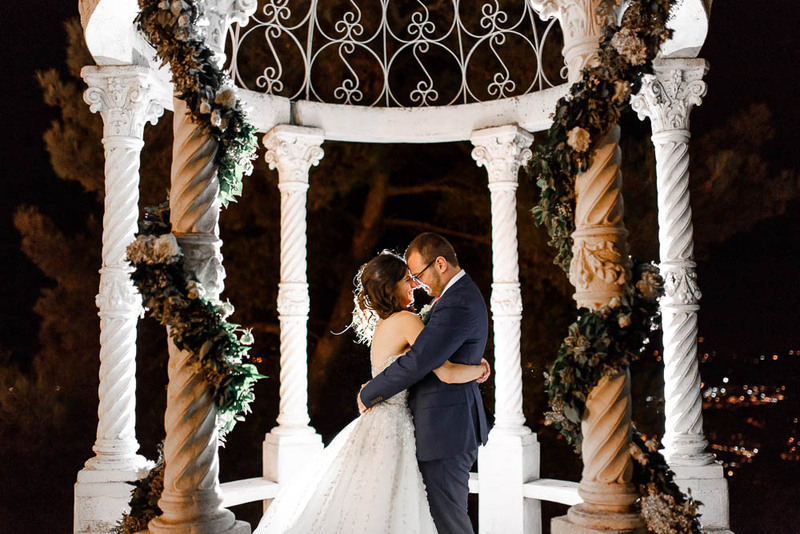 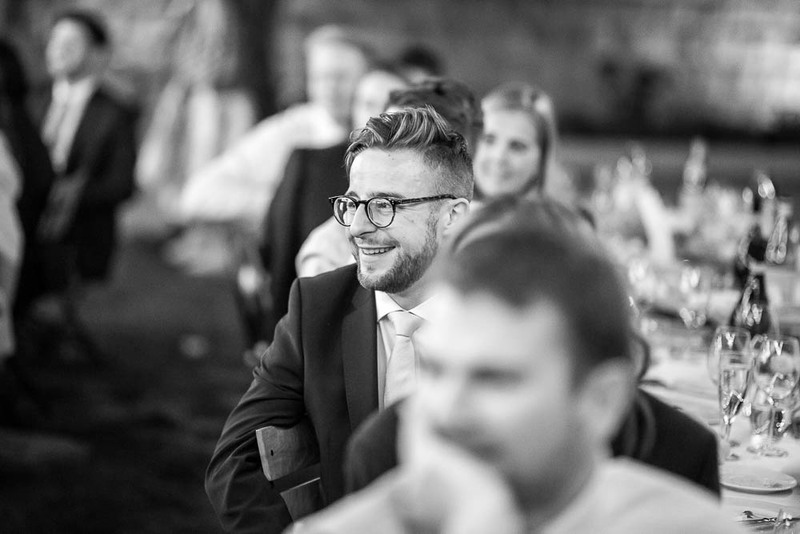 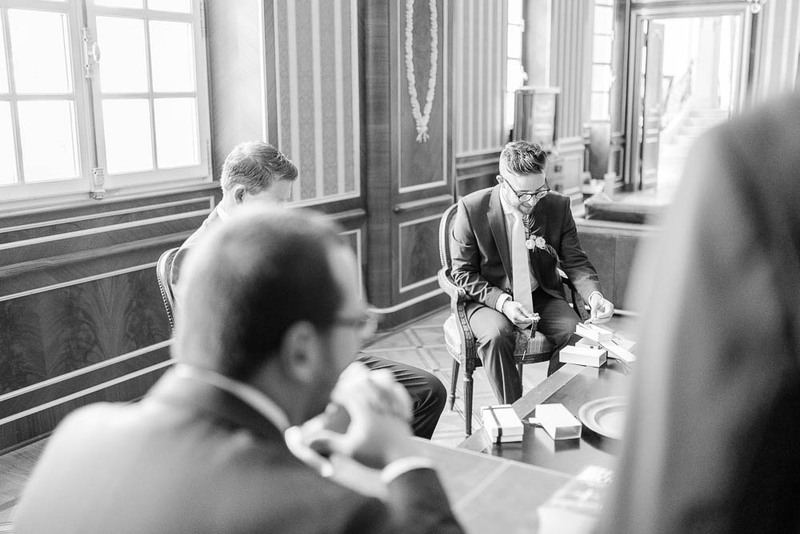 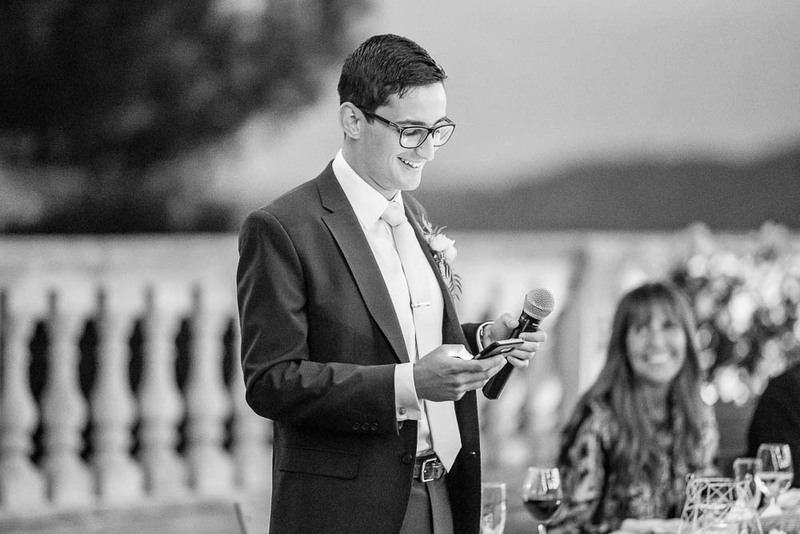 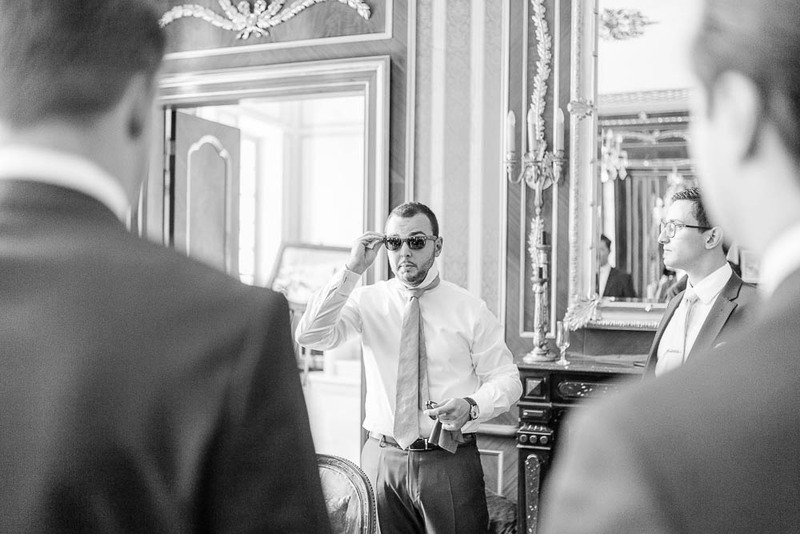 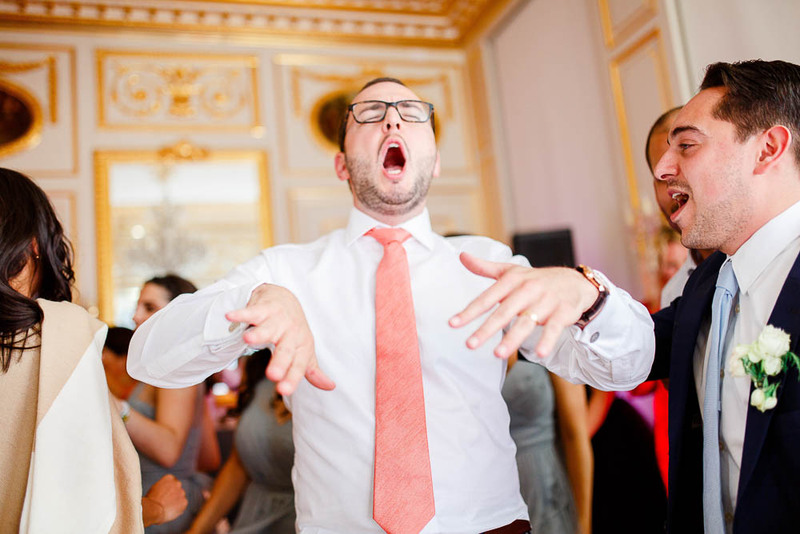 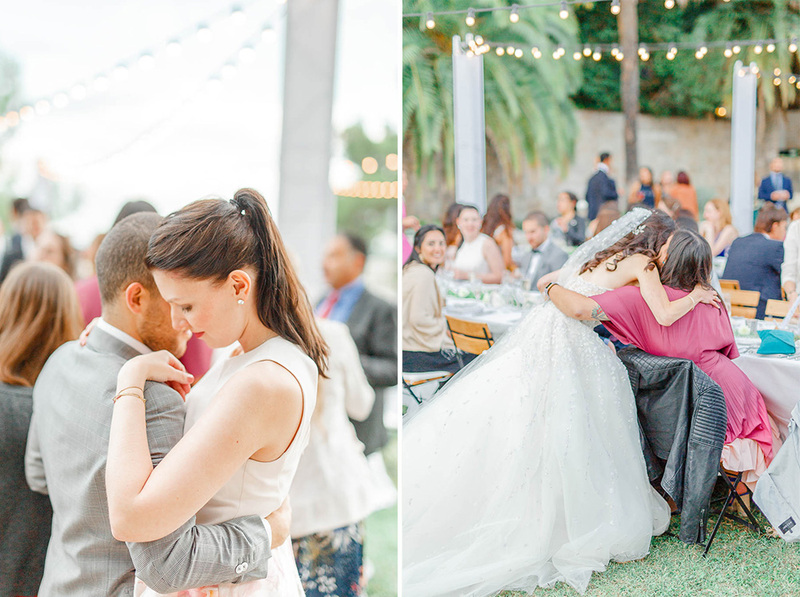 This wedding was nothing short of a dream come true for us. 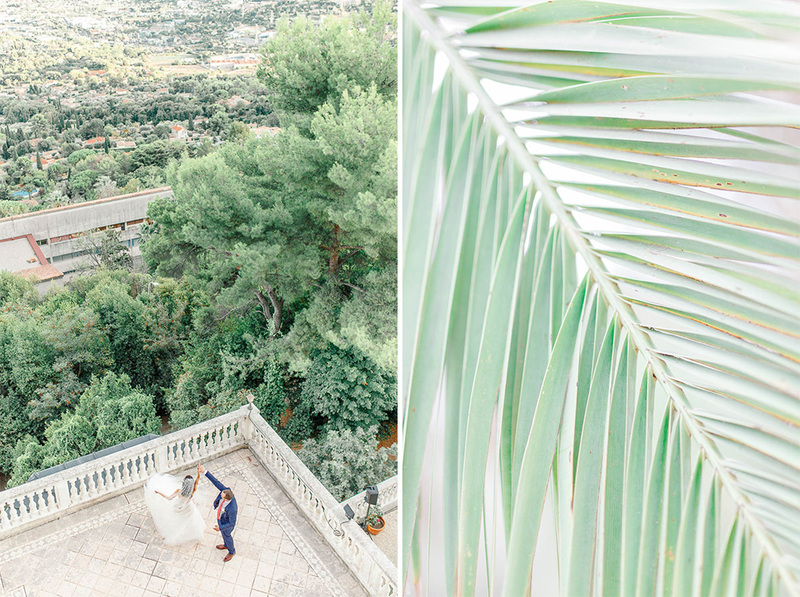 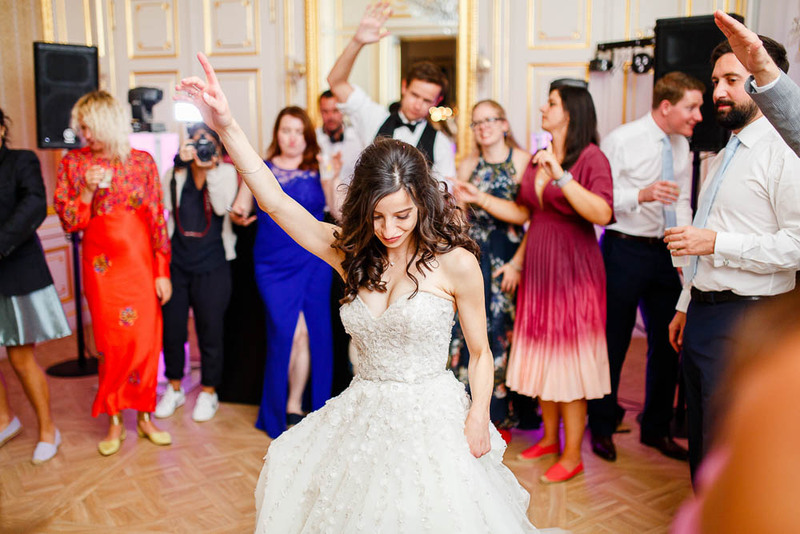 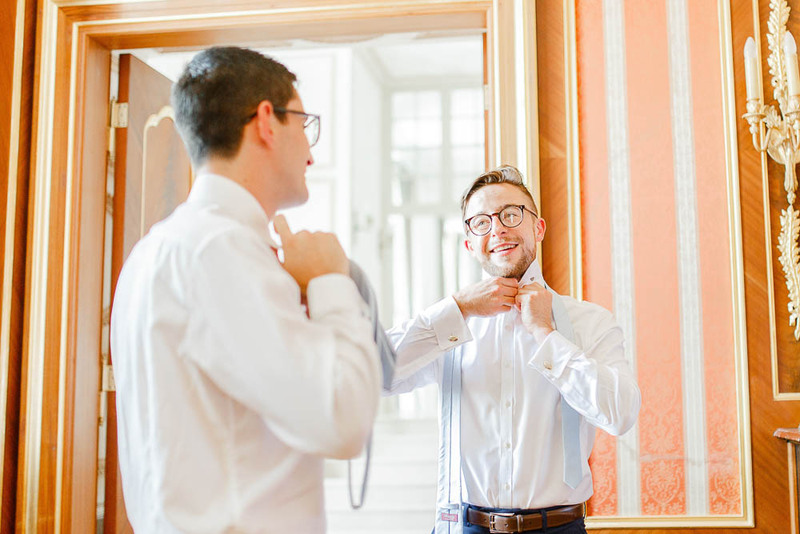 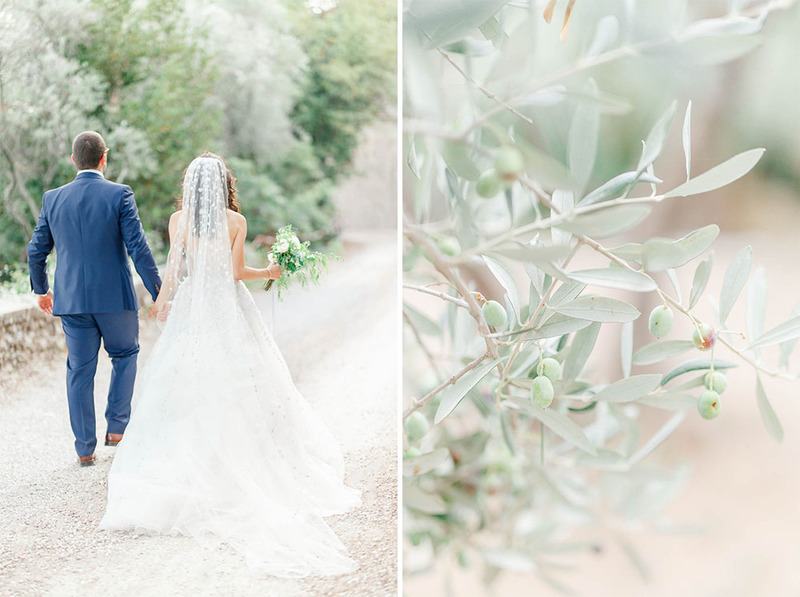 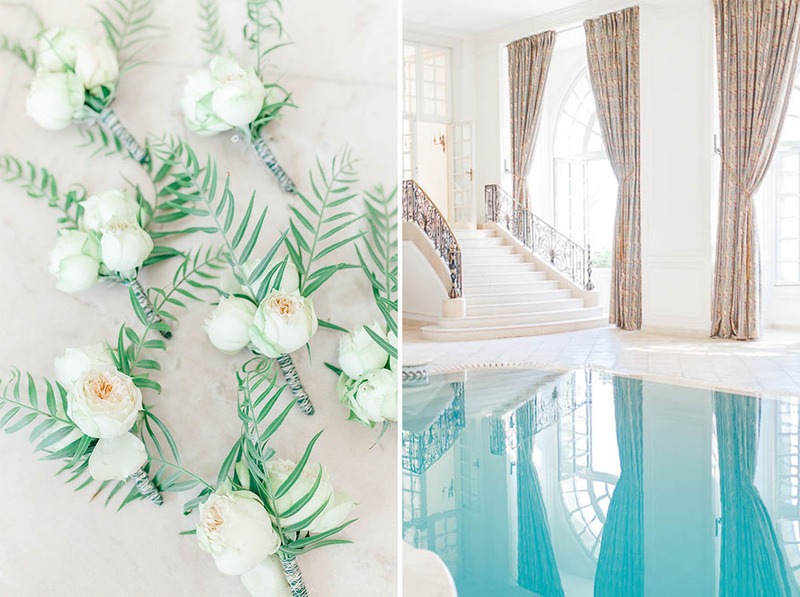 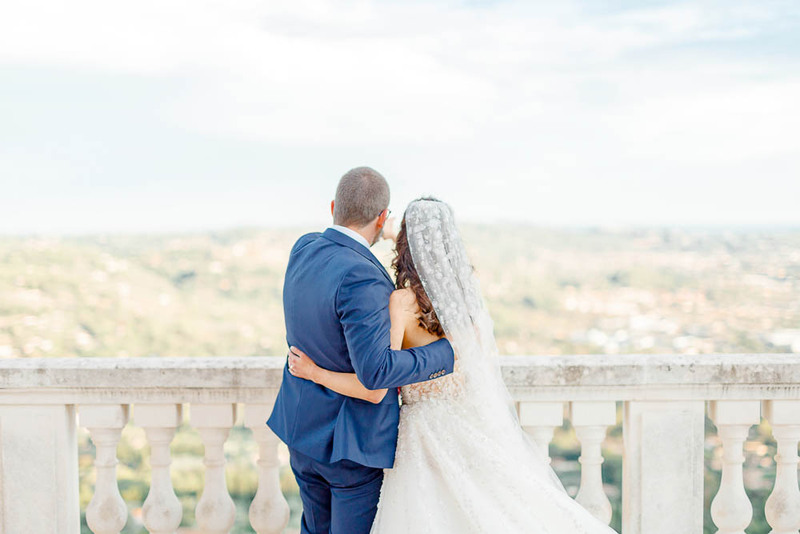 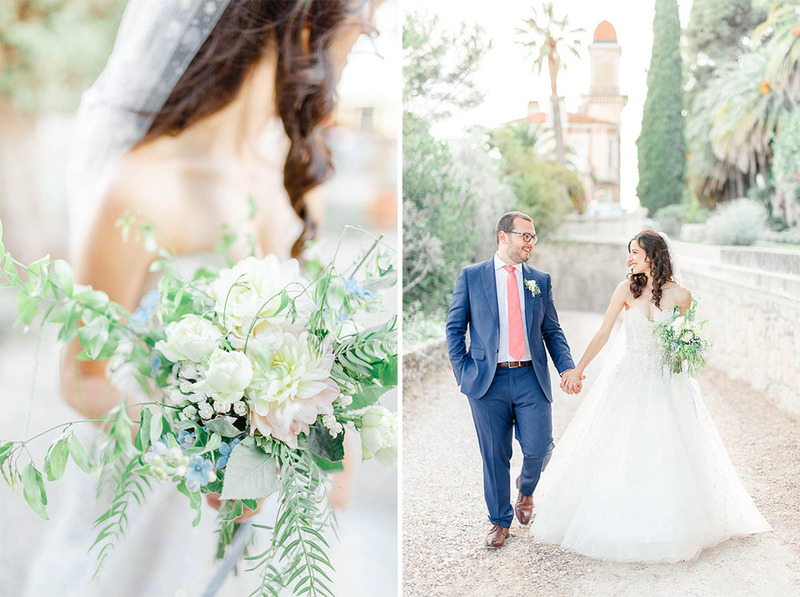 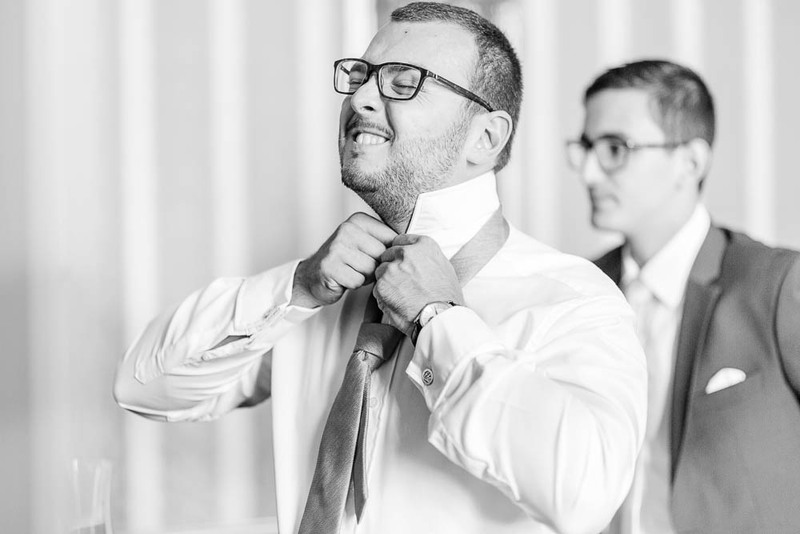 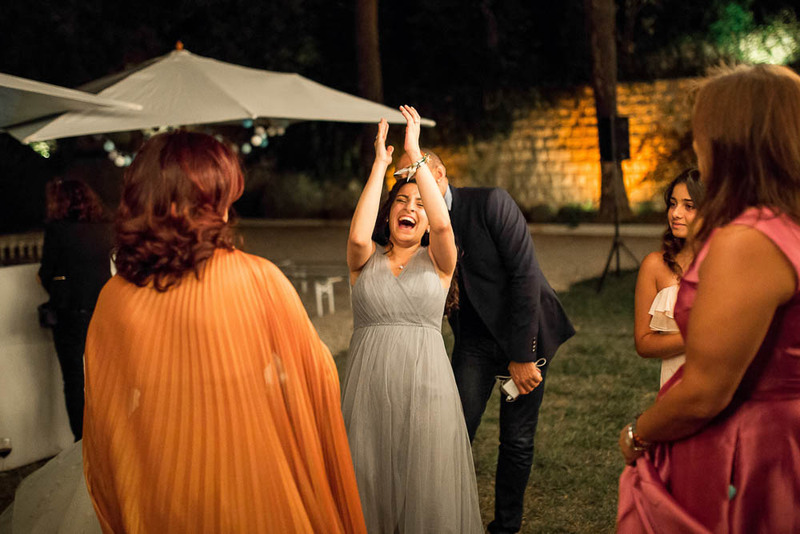 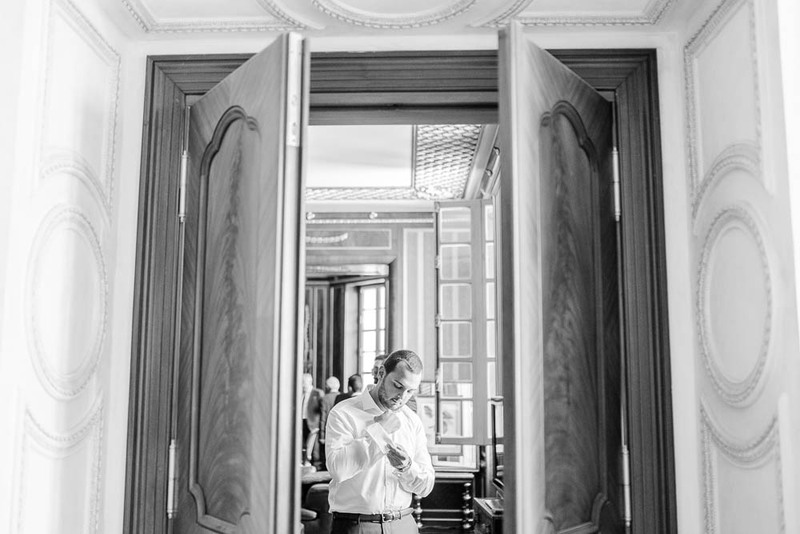 From the moment Yasmeena & Ed first got in touch about photographing their destination wedding in the South of France we were counting down the days (as they undoubtedly were too!) 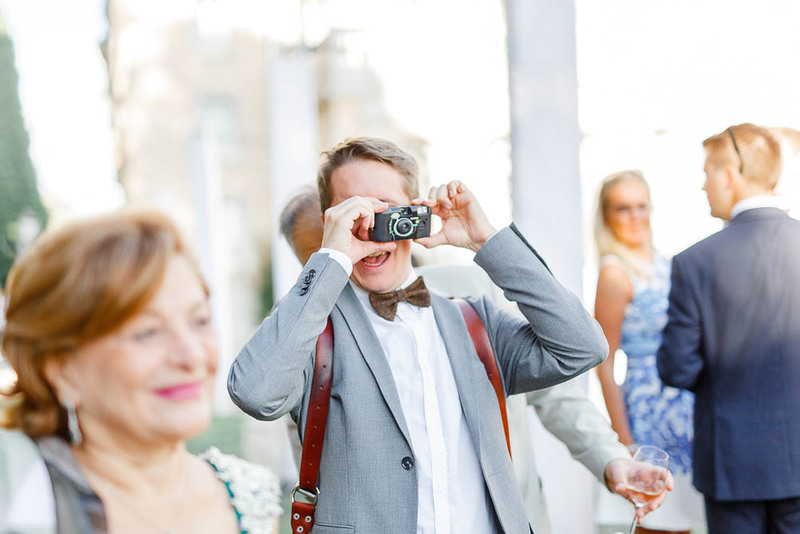 and simply could wait to capture their memories for them. 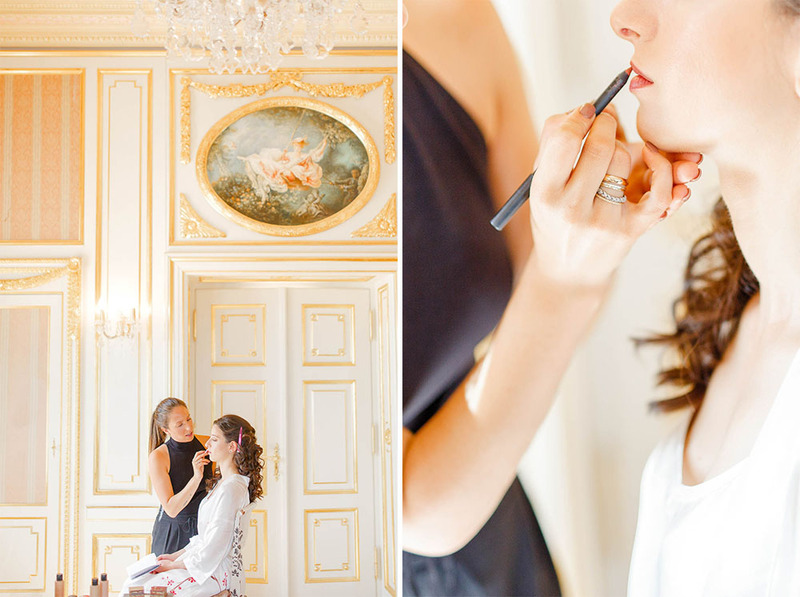 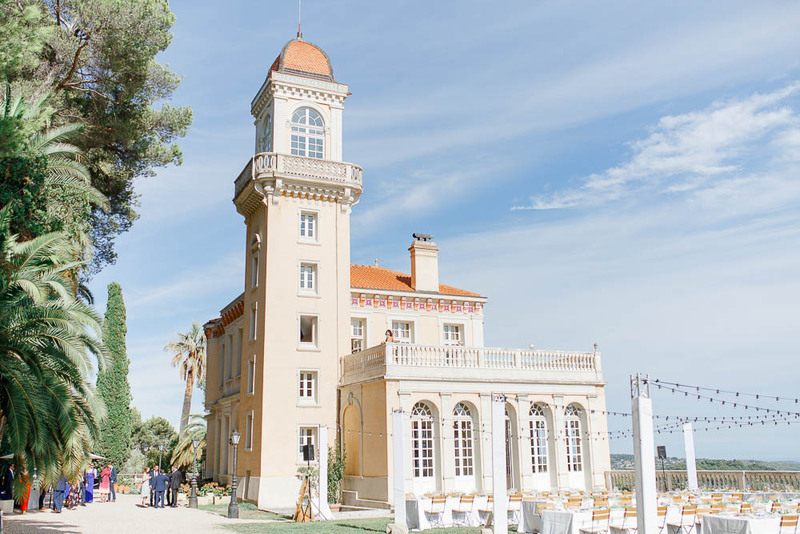 We flew into Nice a couple of days in advance, and when the date finally arrived and we approached Château Saint Georges in Grasse we can truly say it took our breath away. 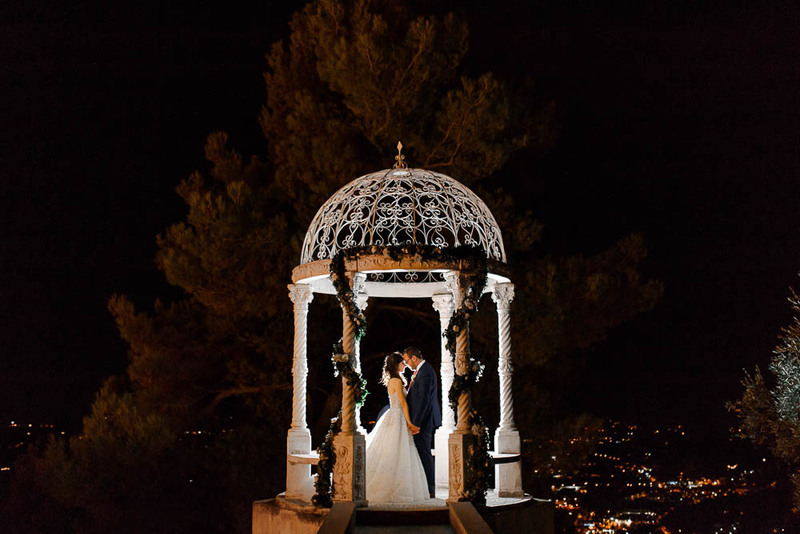 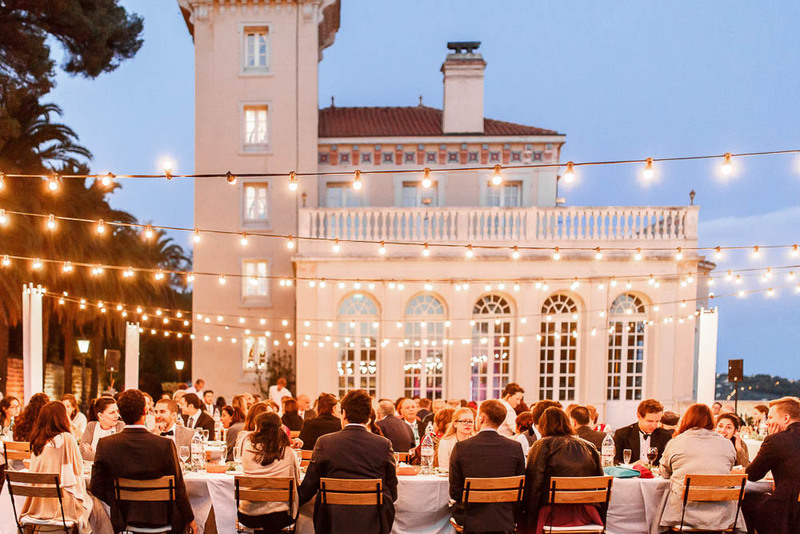 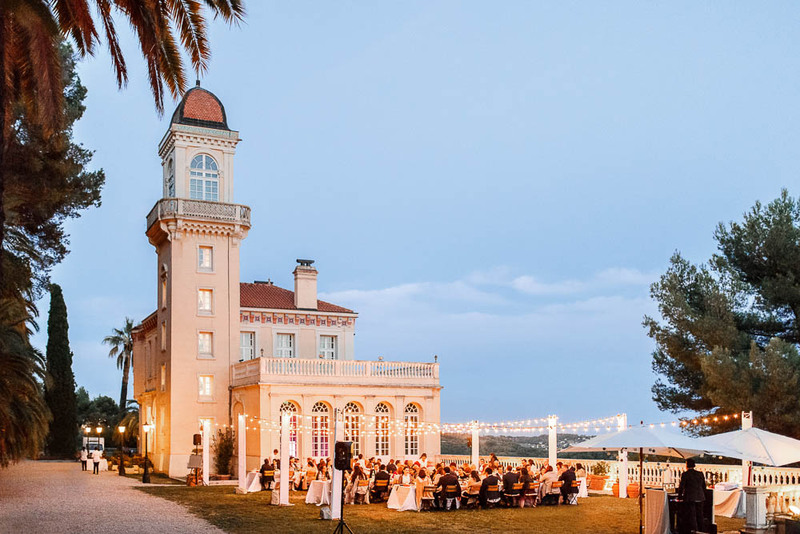 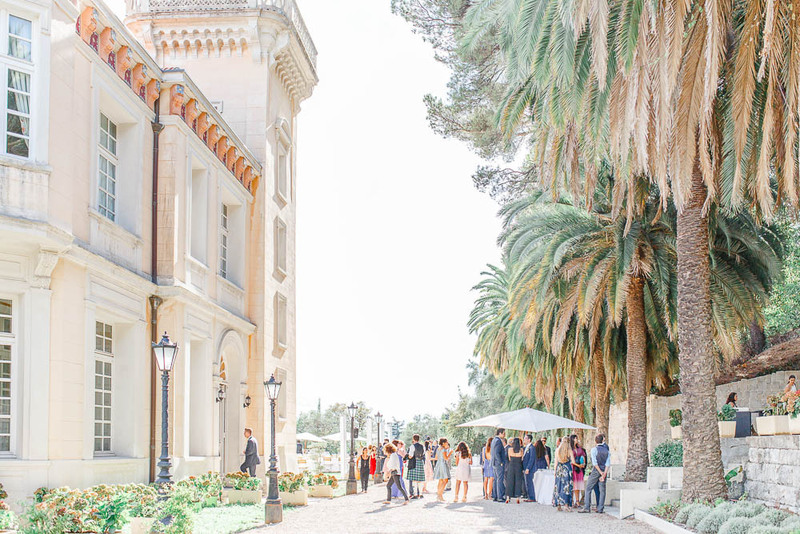 Château Saint Georges stands majestically on a hillside with far reaching views over Grasse and the sparkling Côte d’Azur – the perfect place to hold a celebration with guests travelling from all over the world. 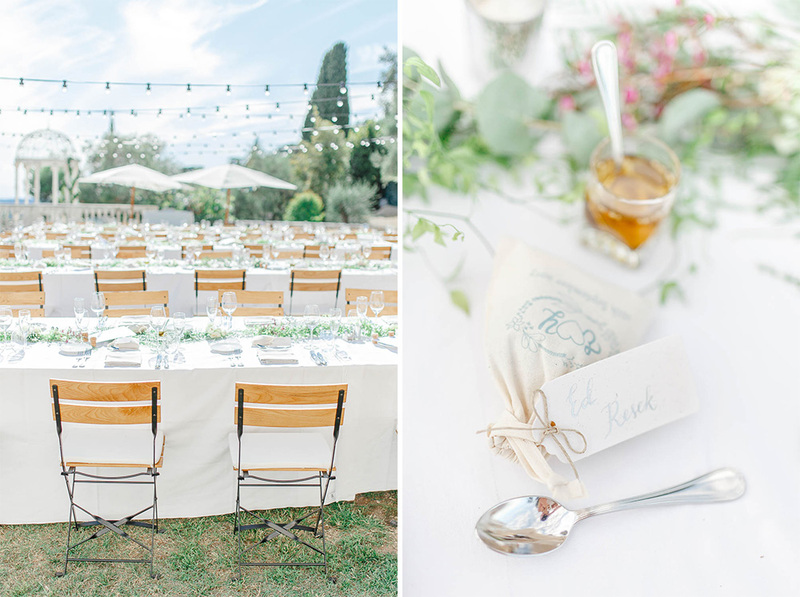 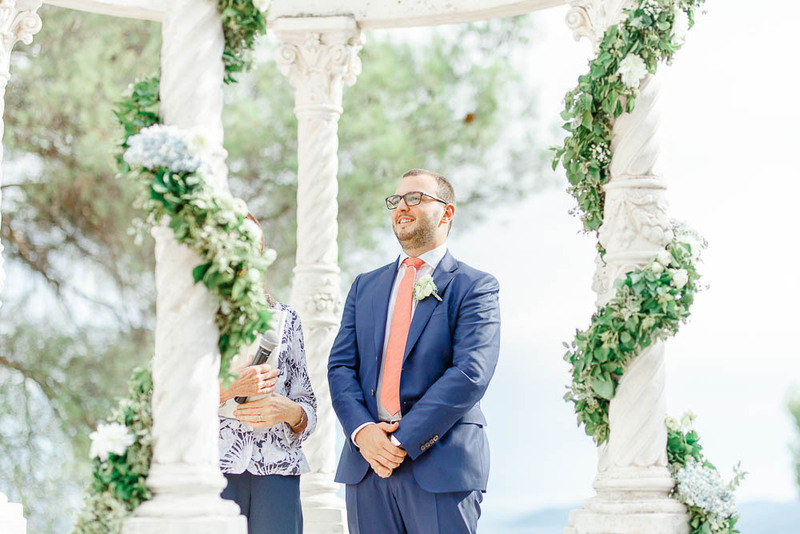 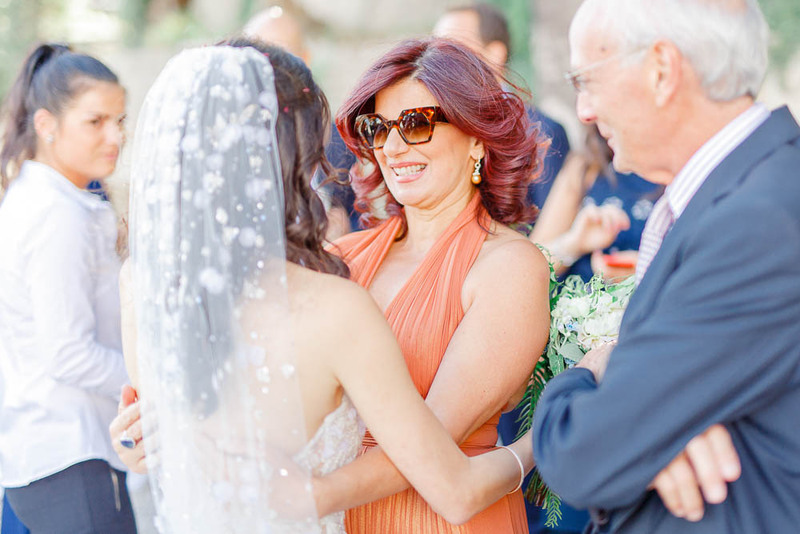 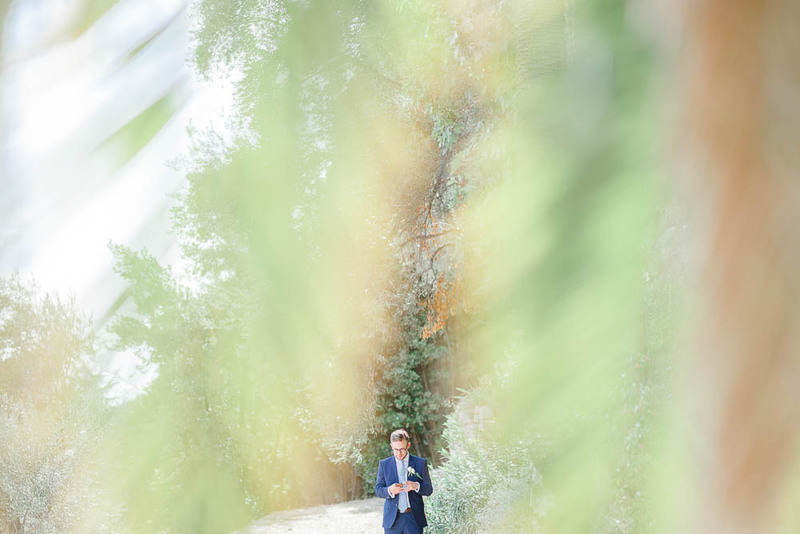 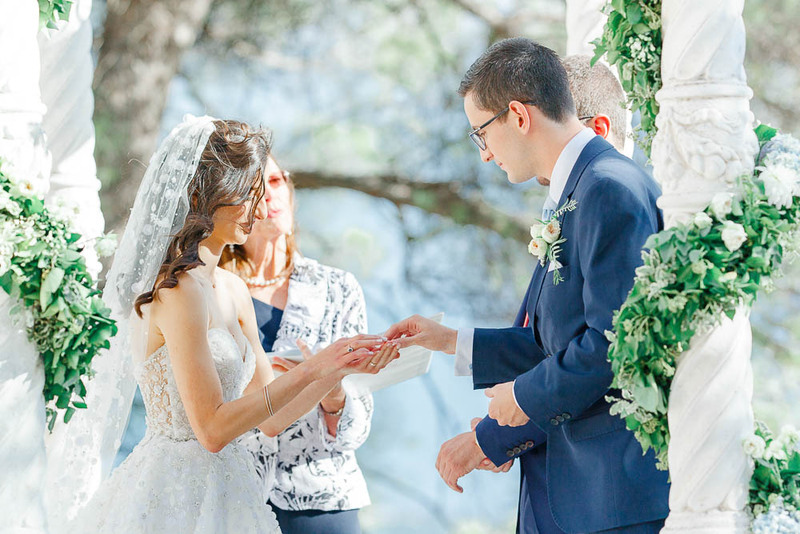 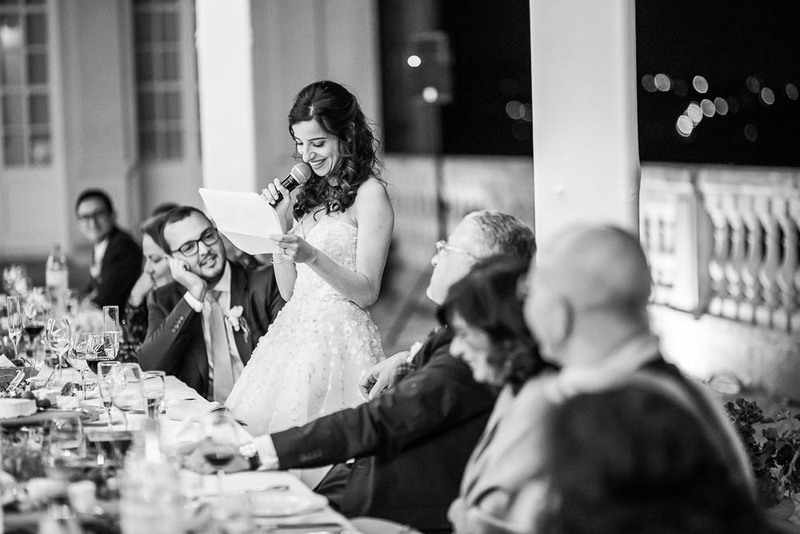 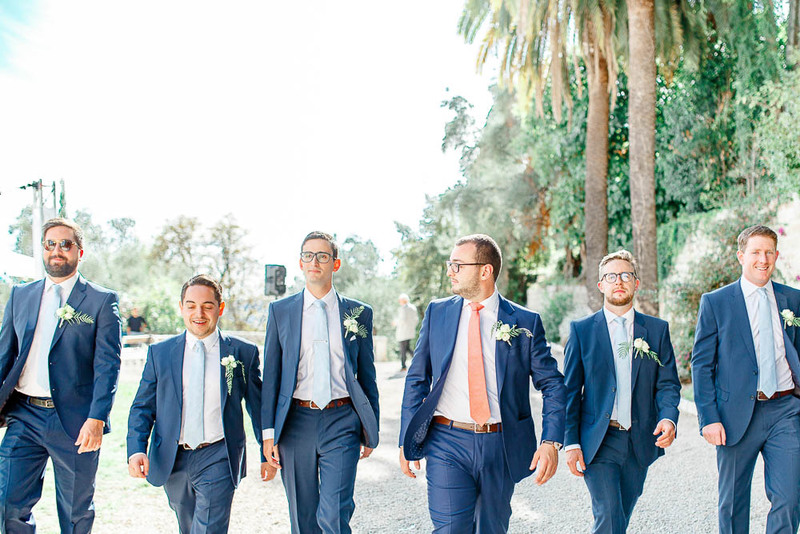 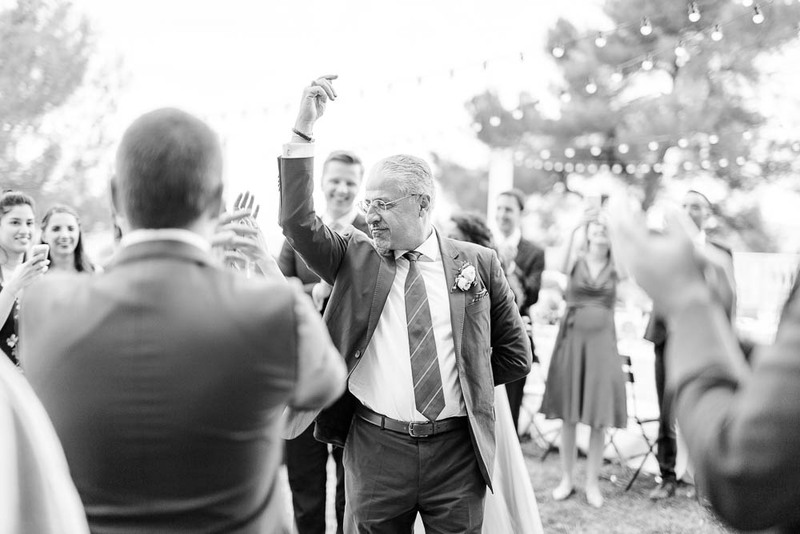 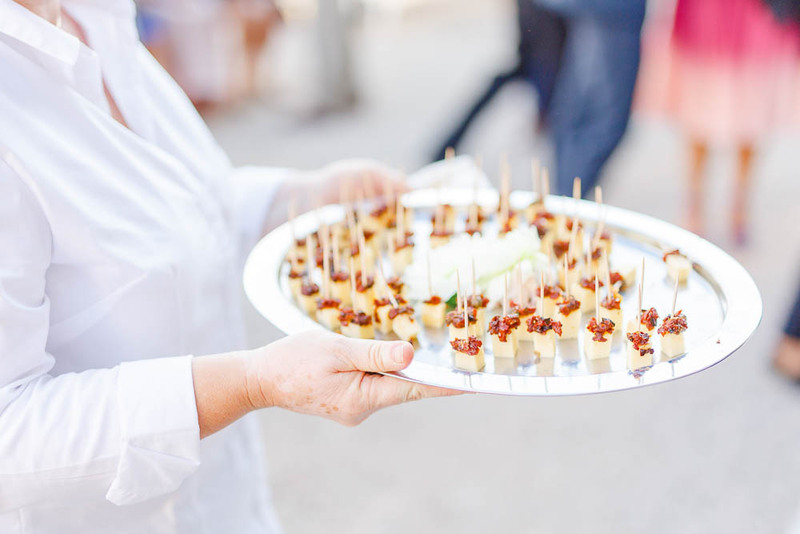 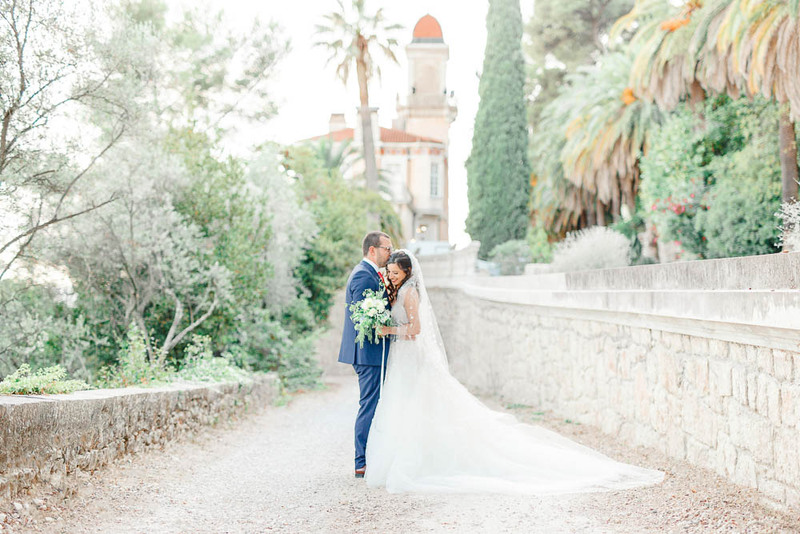 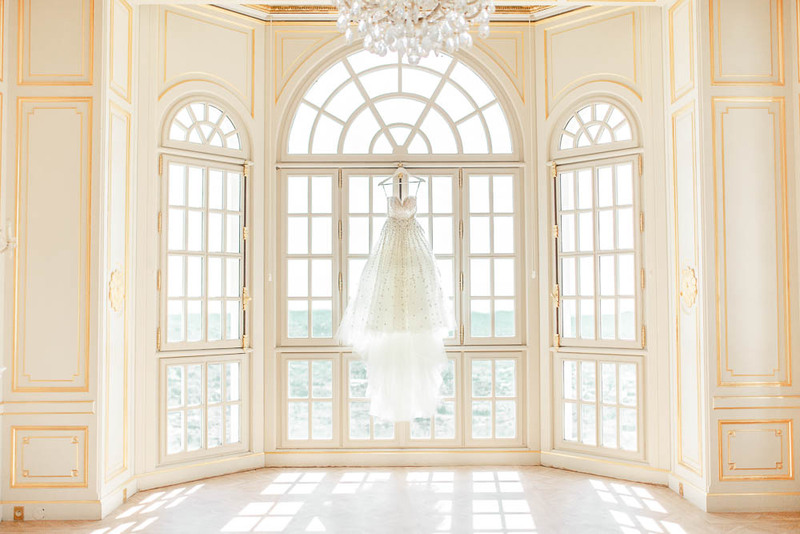 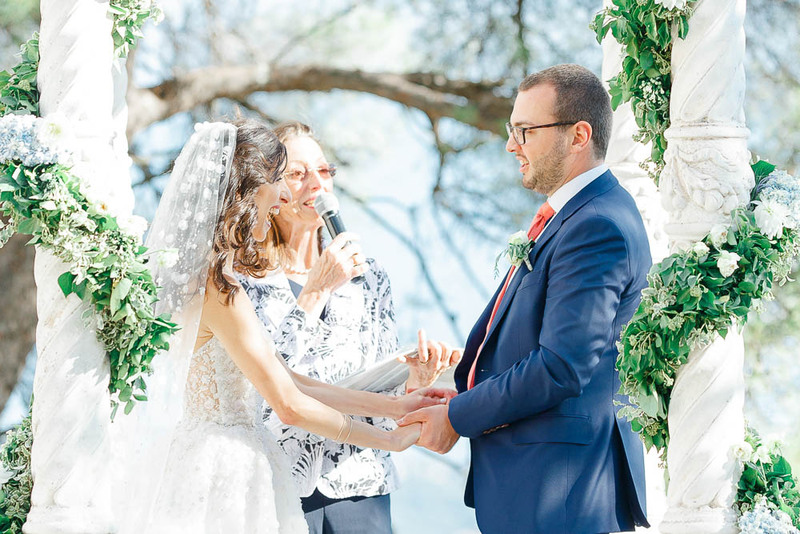 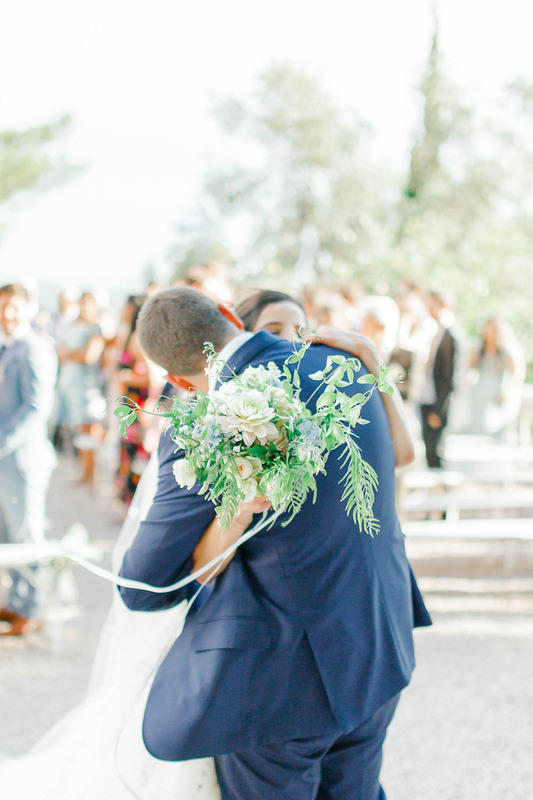 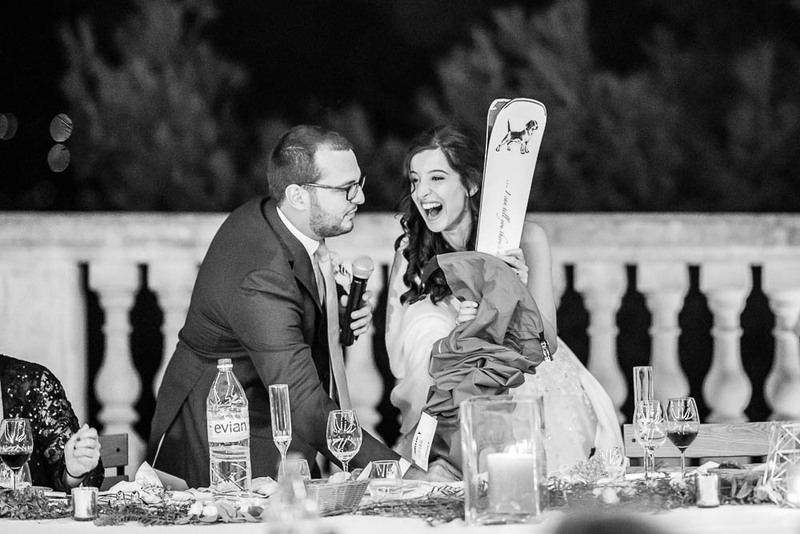 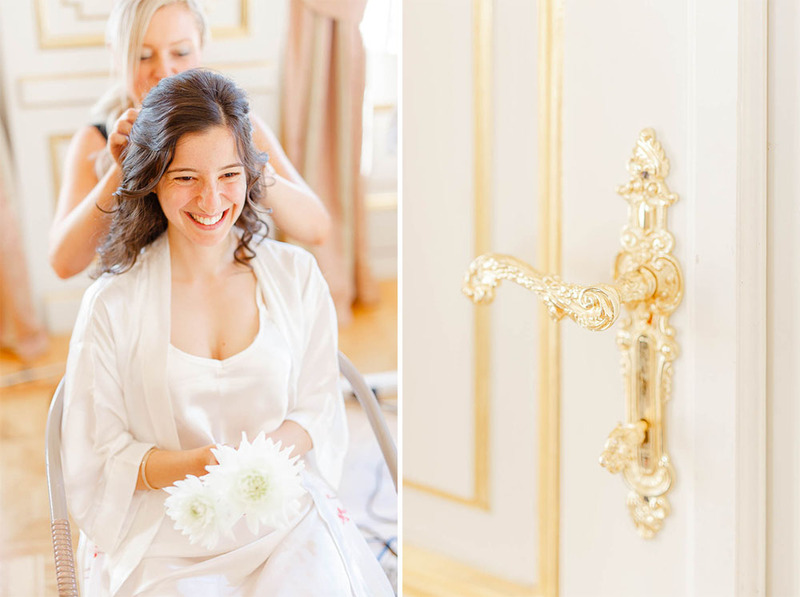 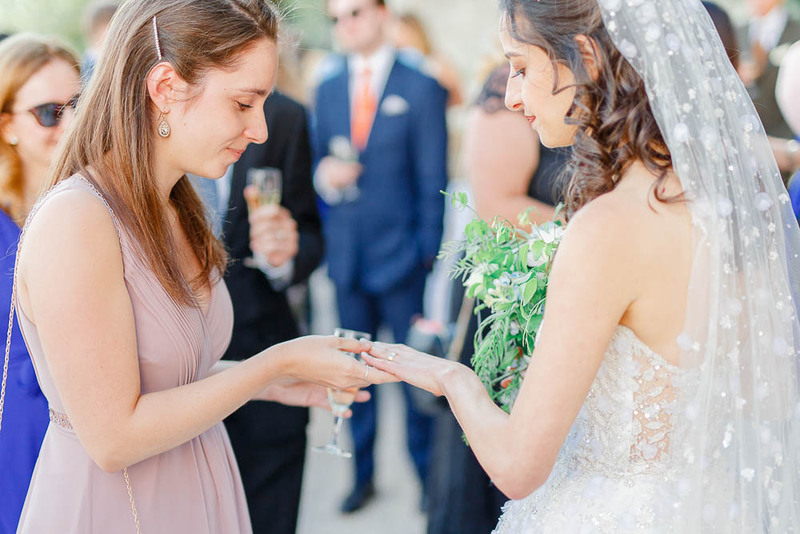 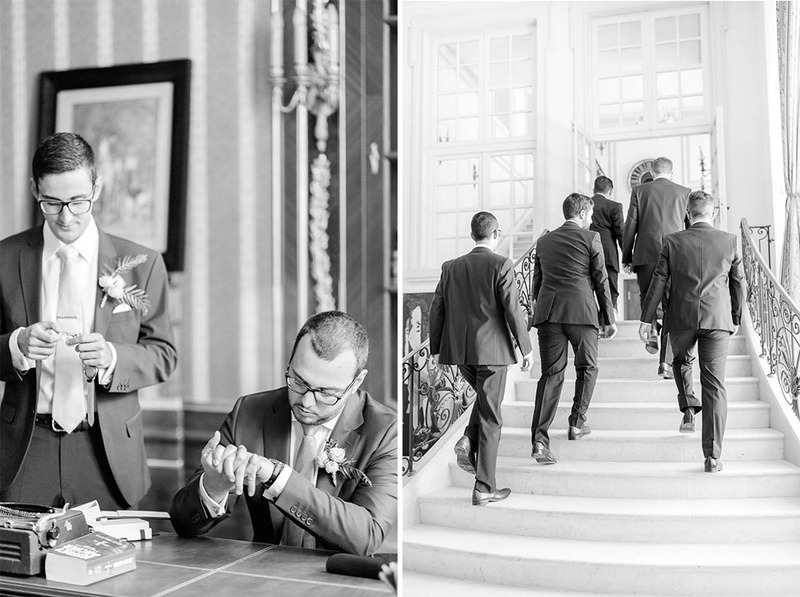 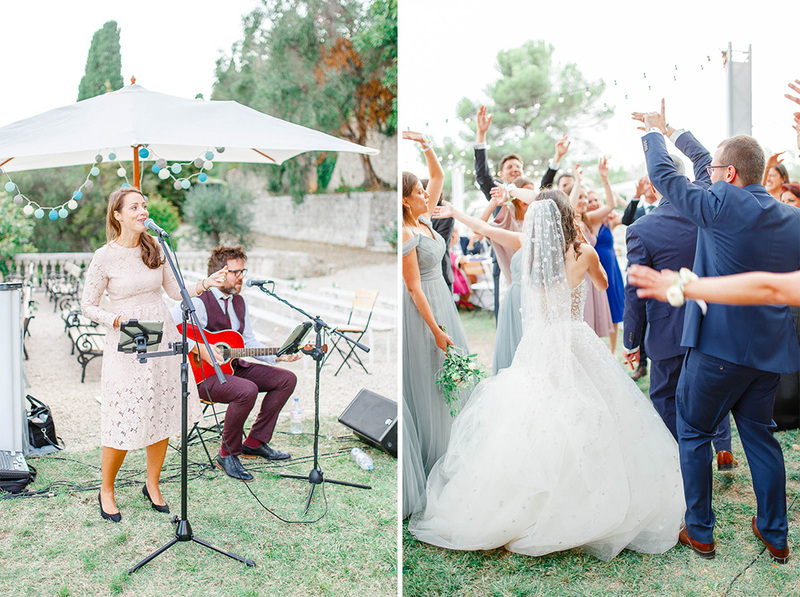 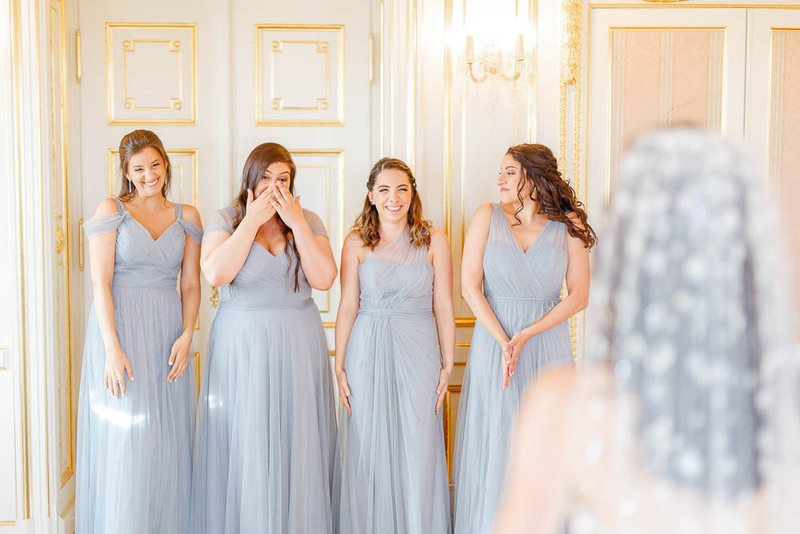 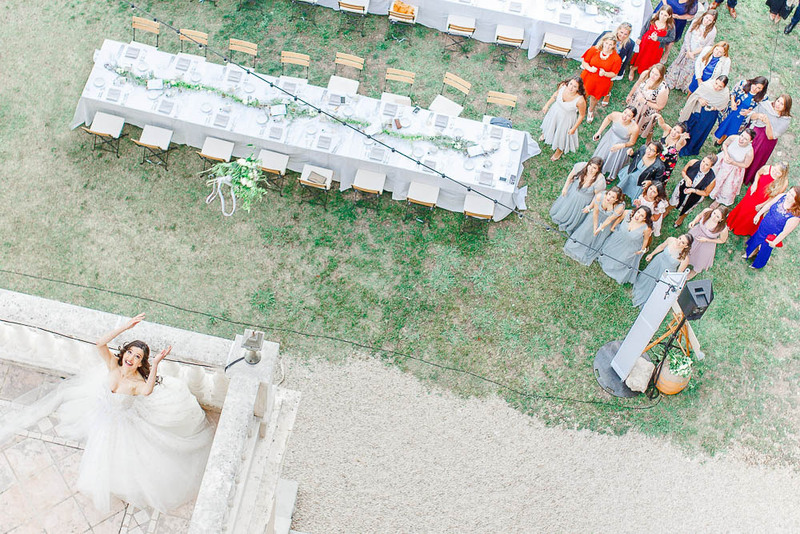 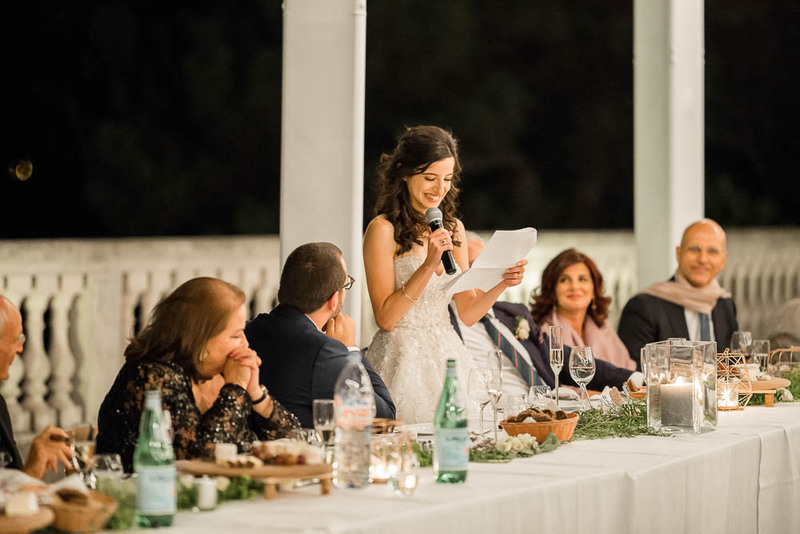 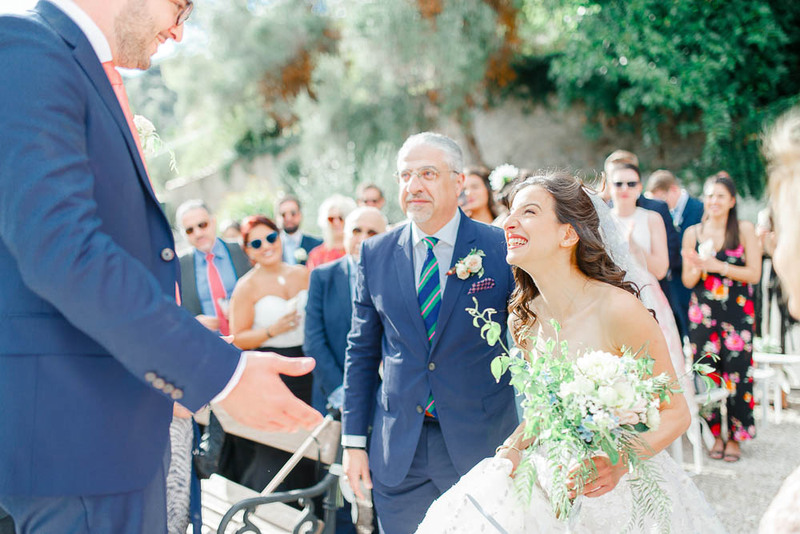 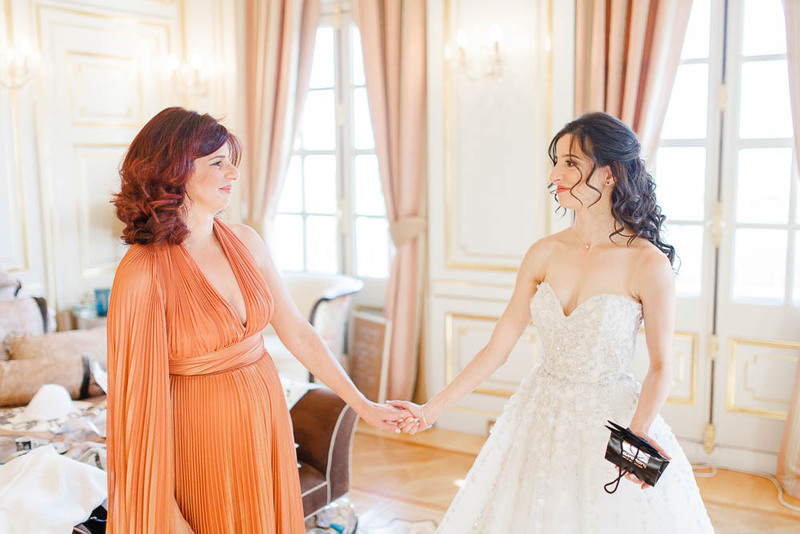 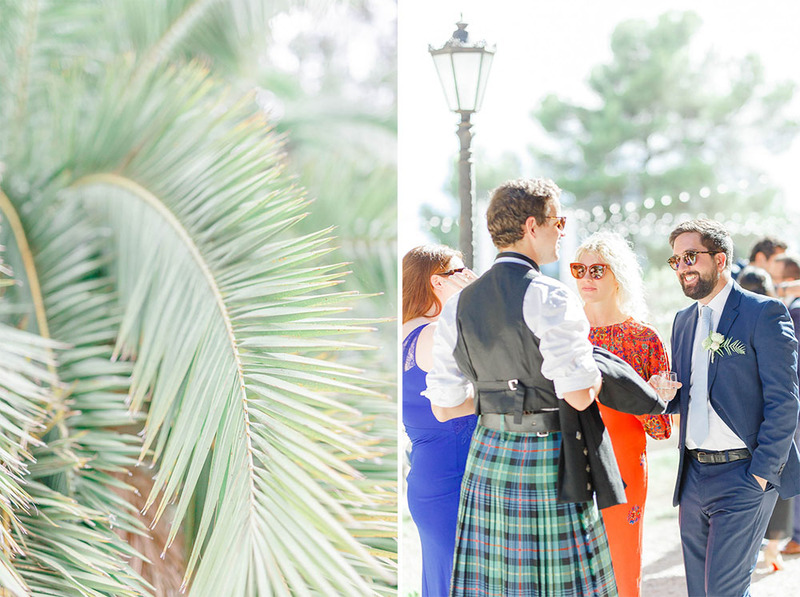 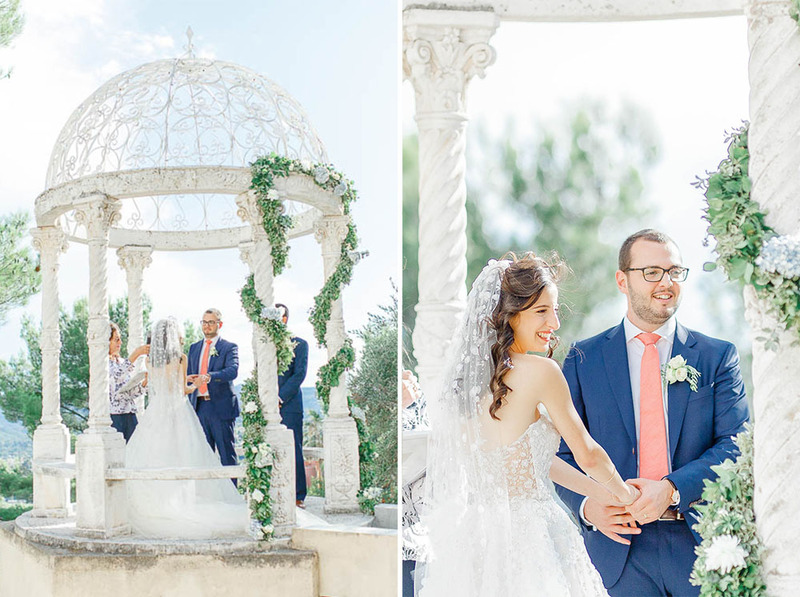 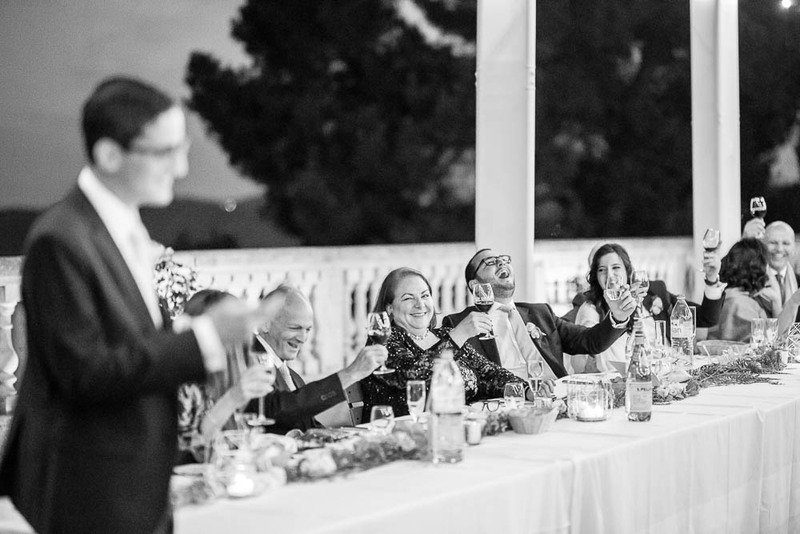 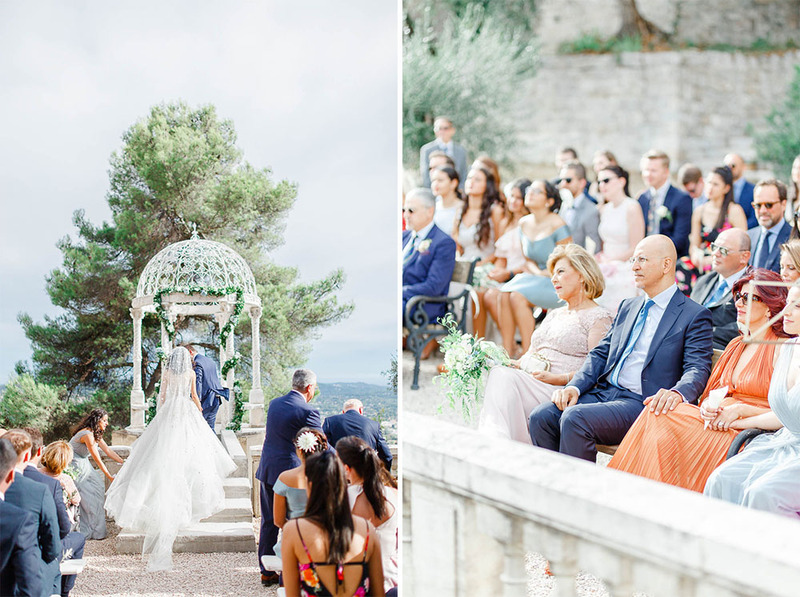 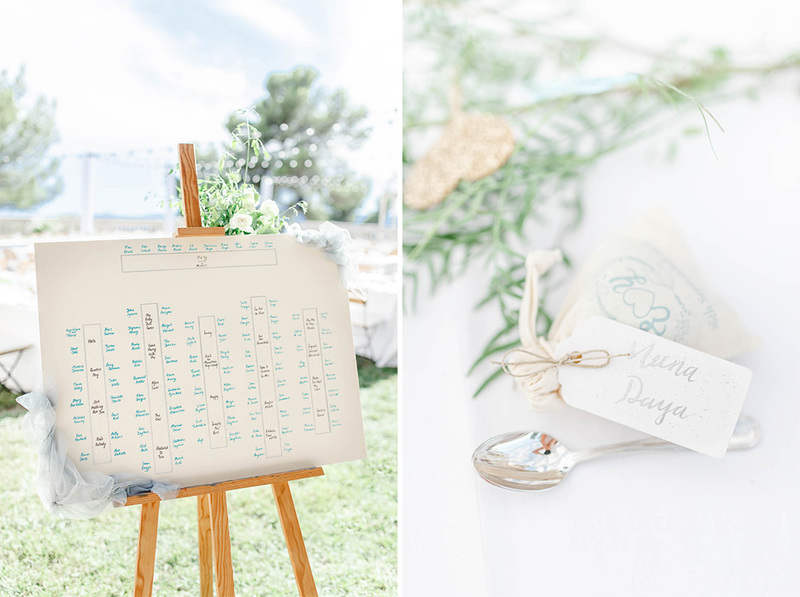 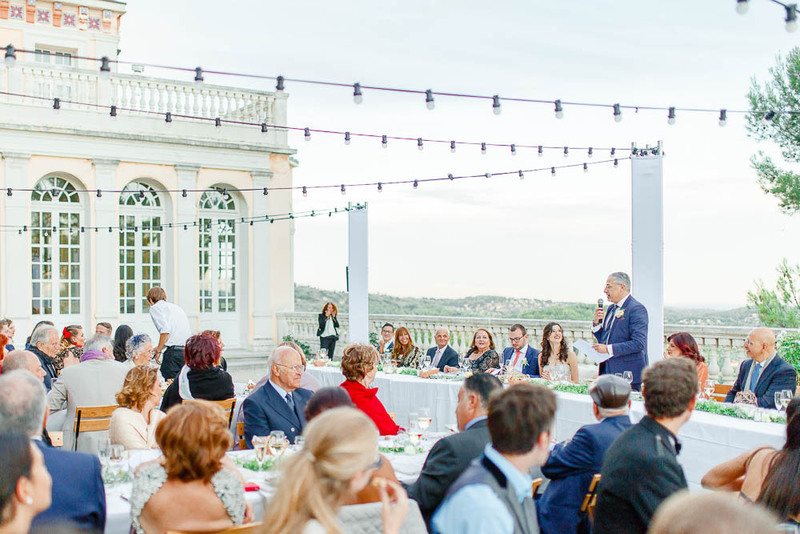 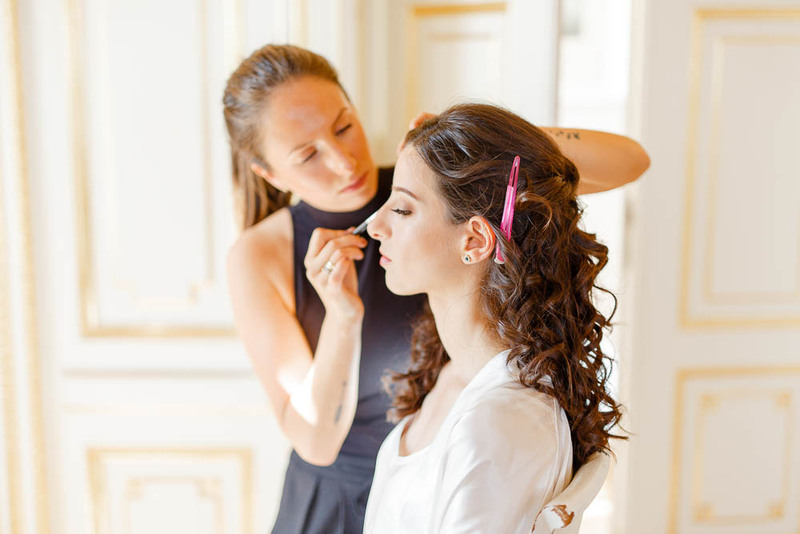 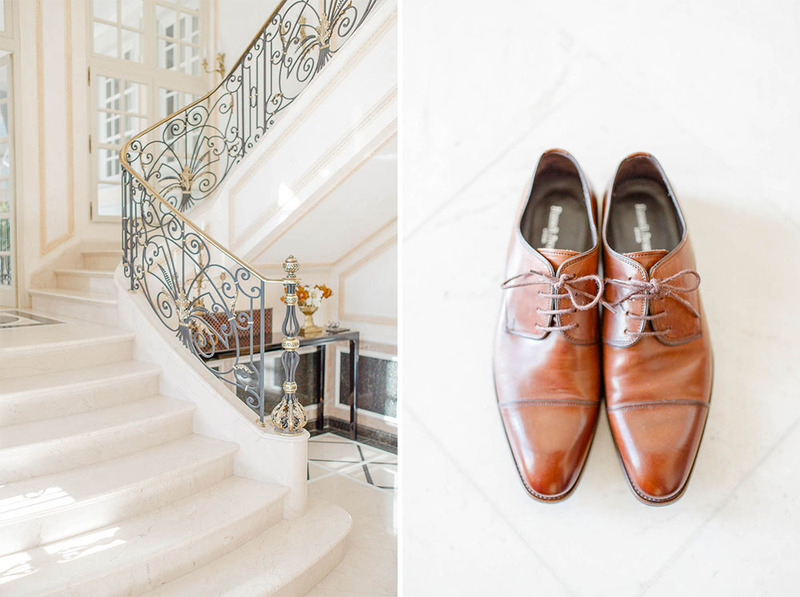 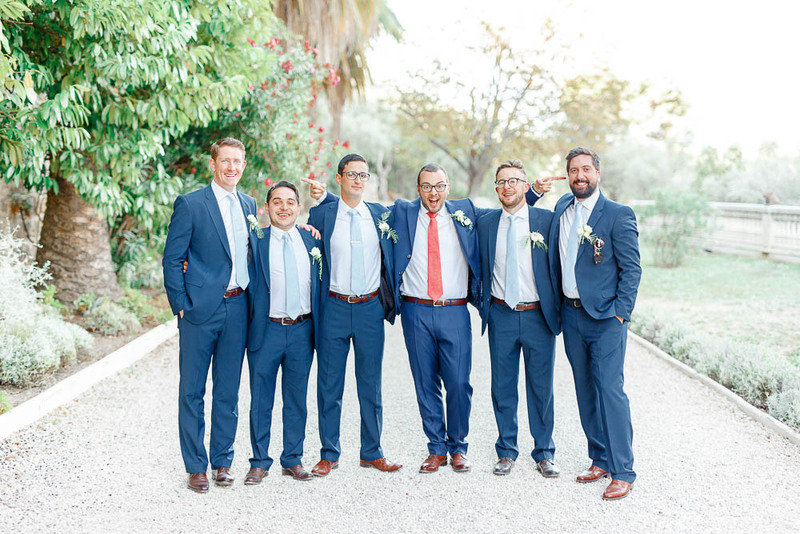 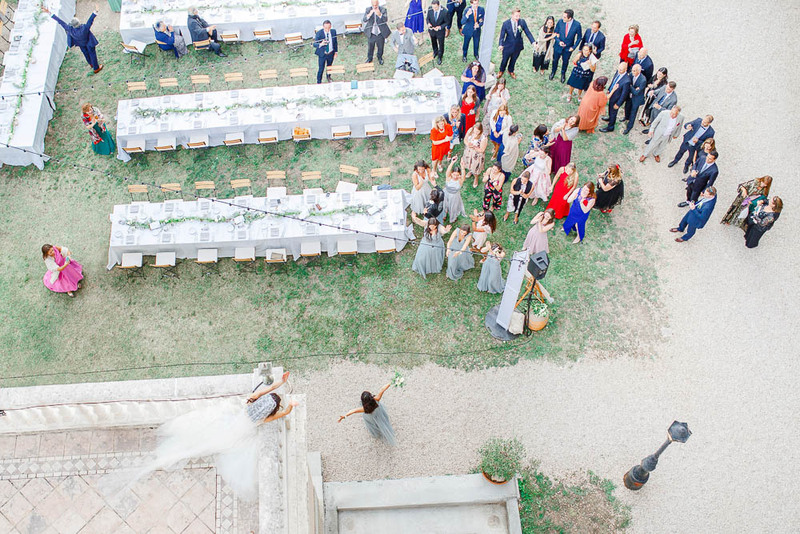 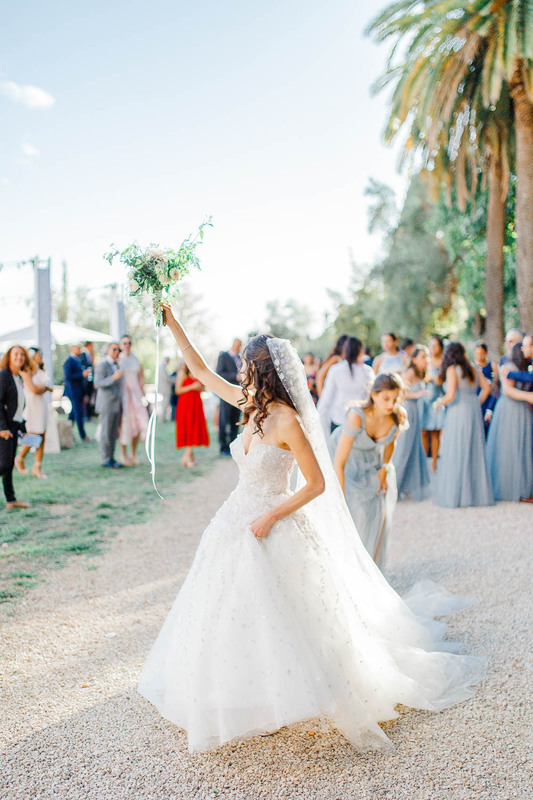 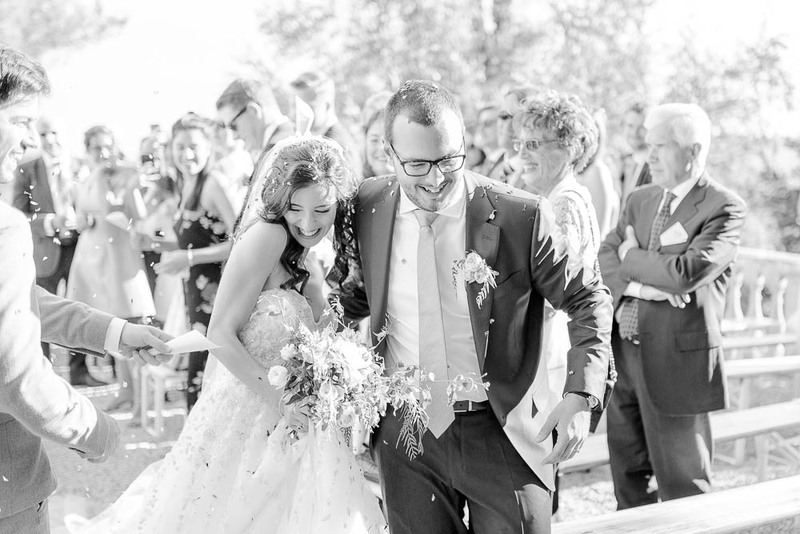 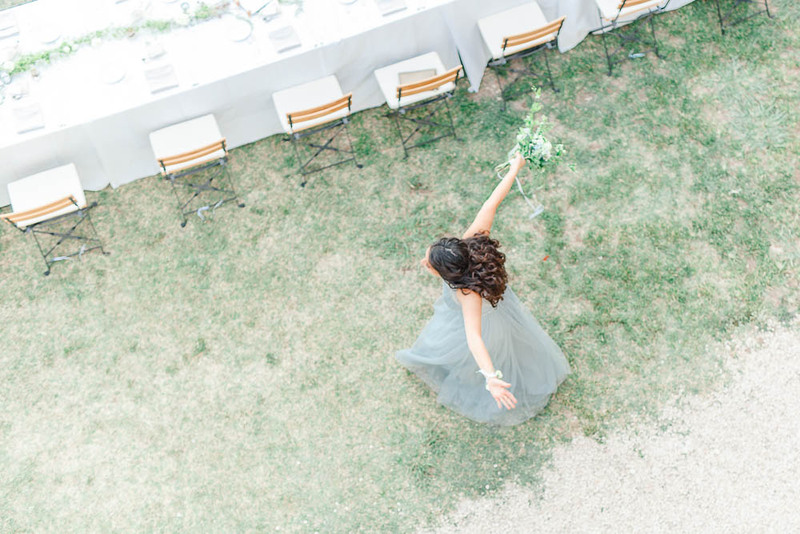 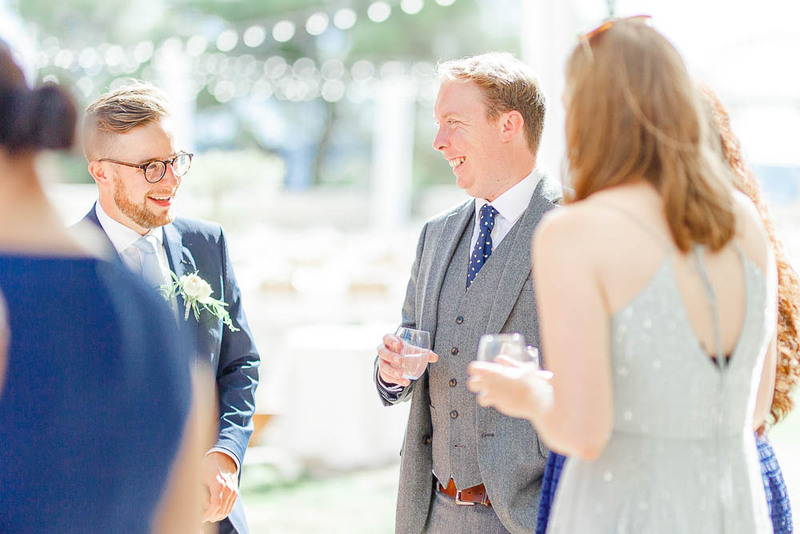 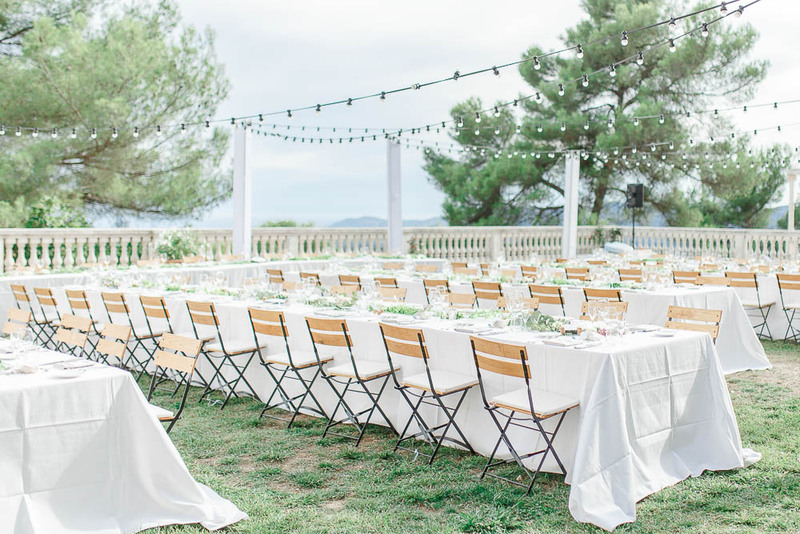 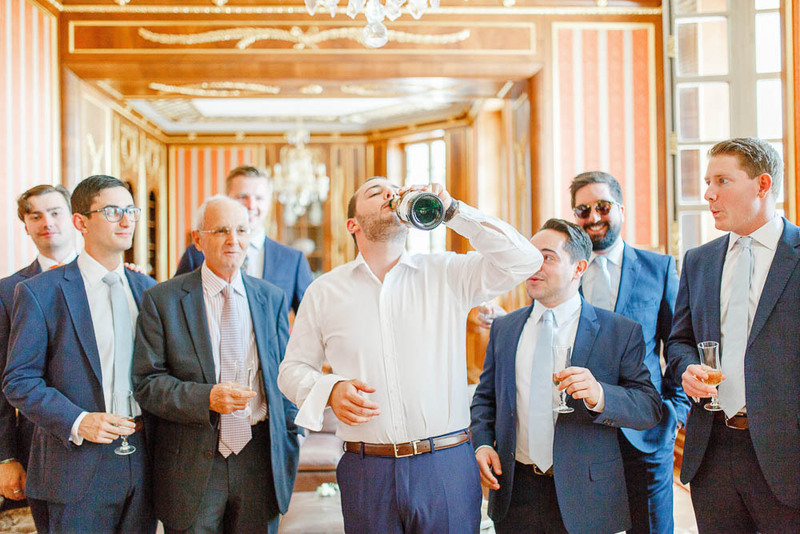 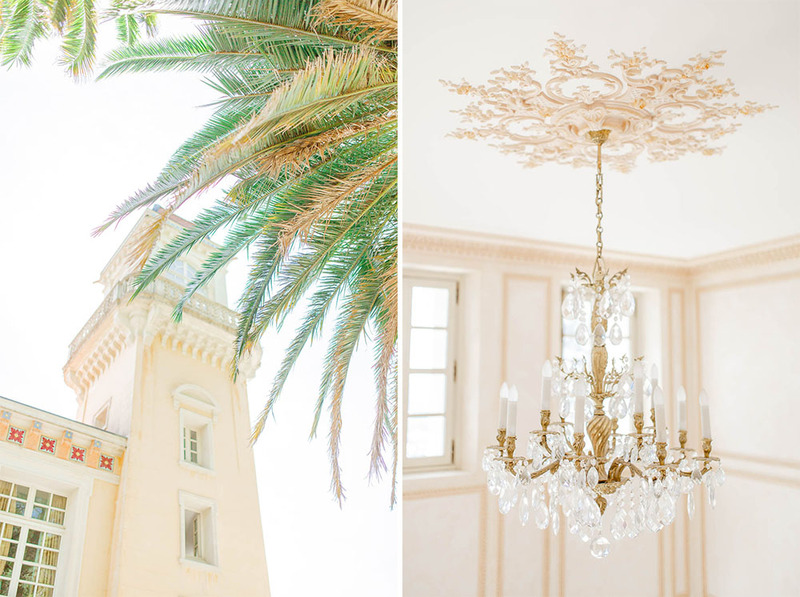 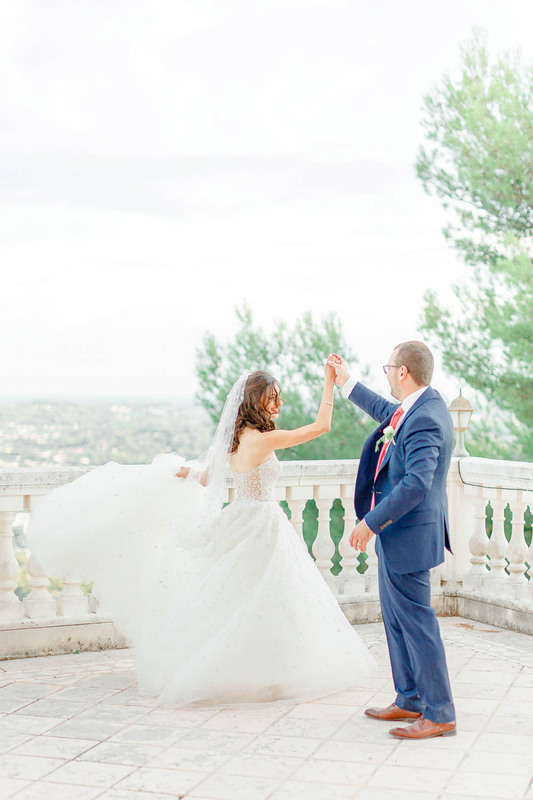 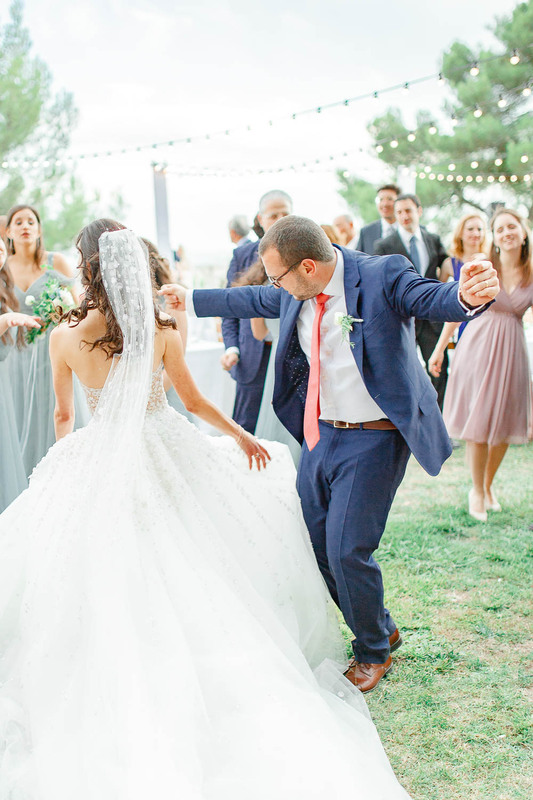 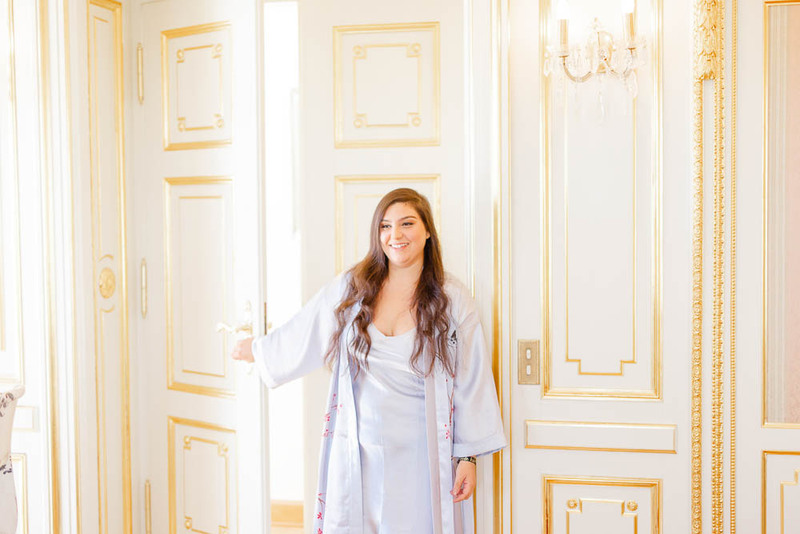 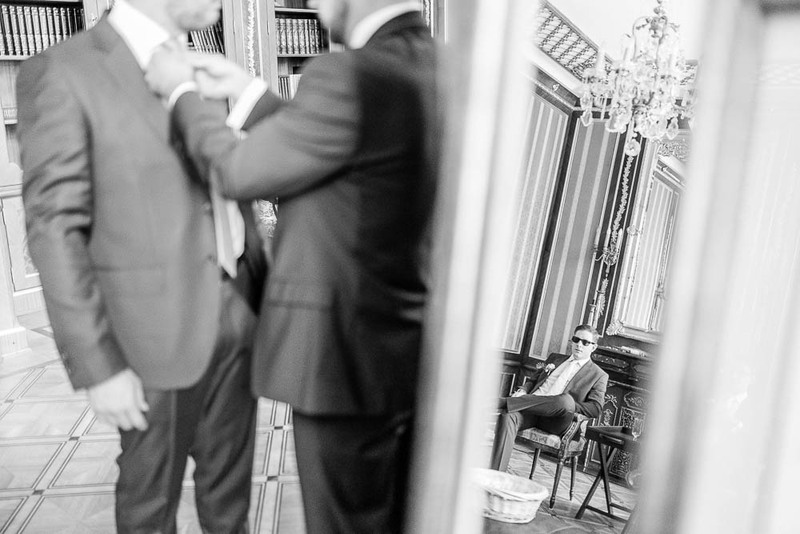 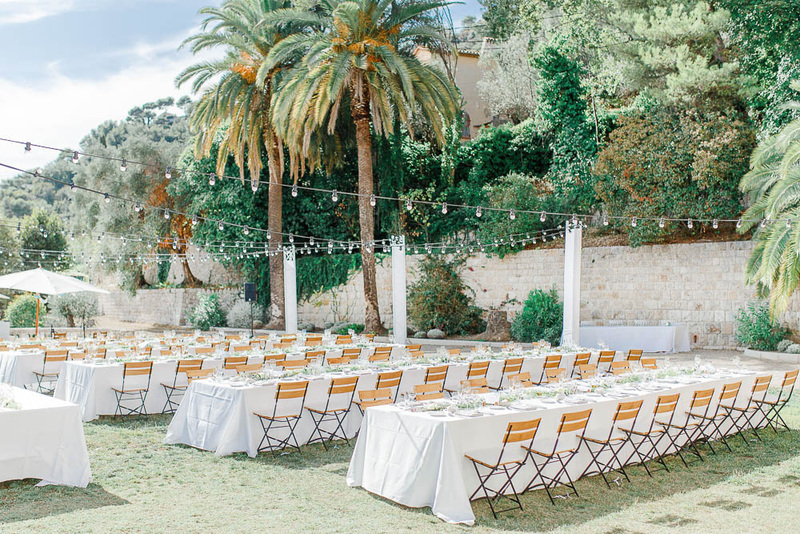 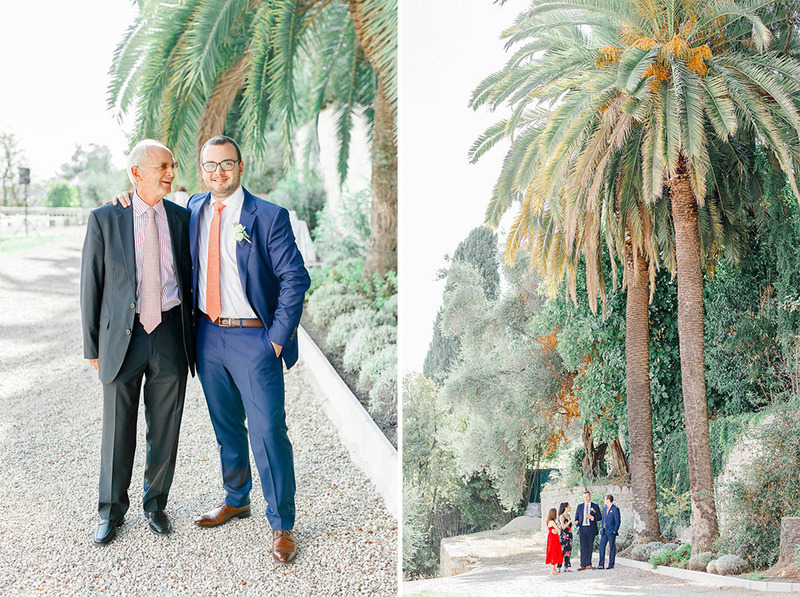 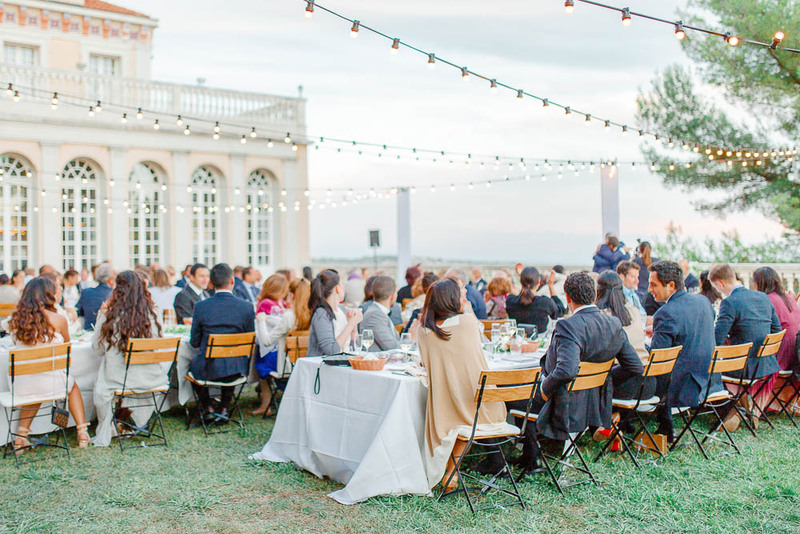 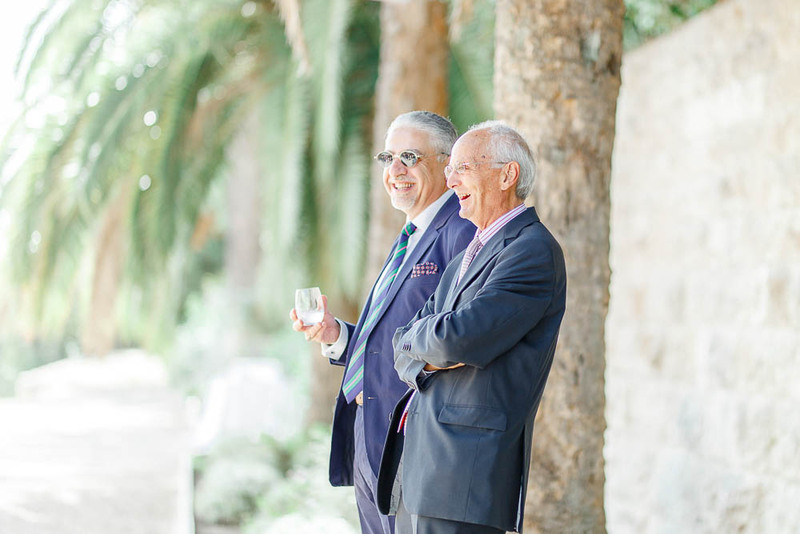 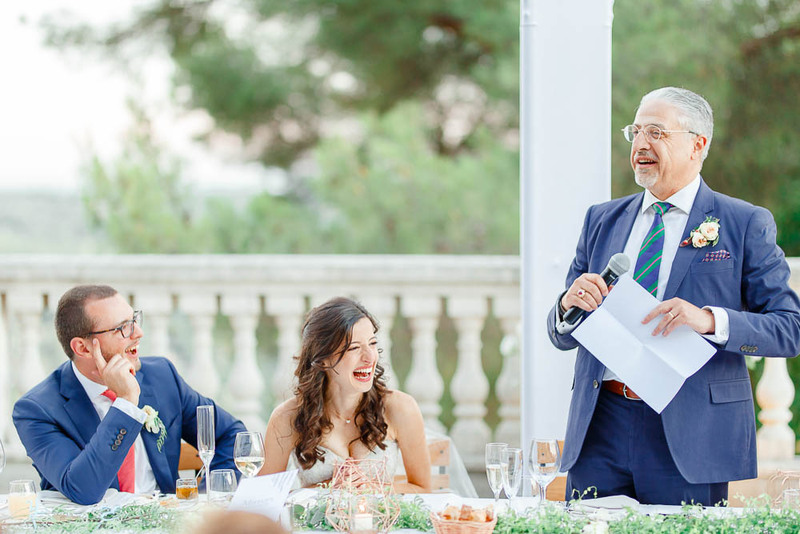 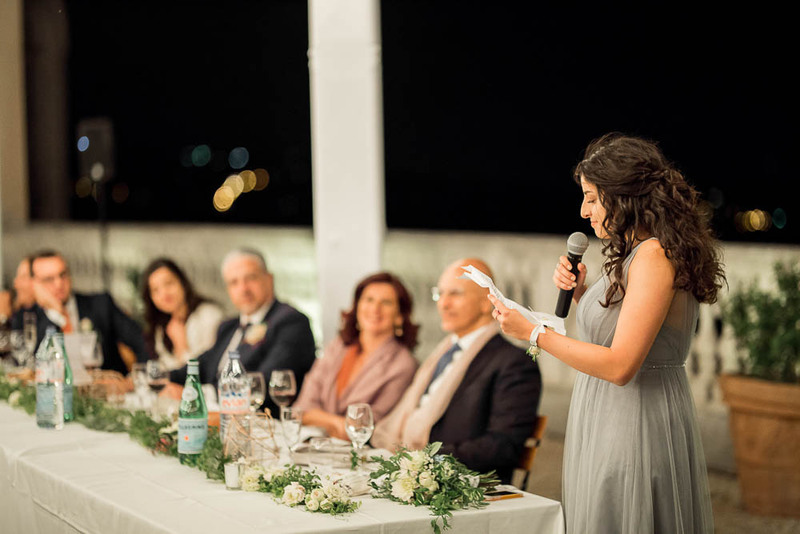 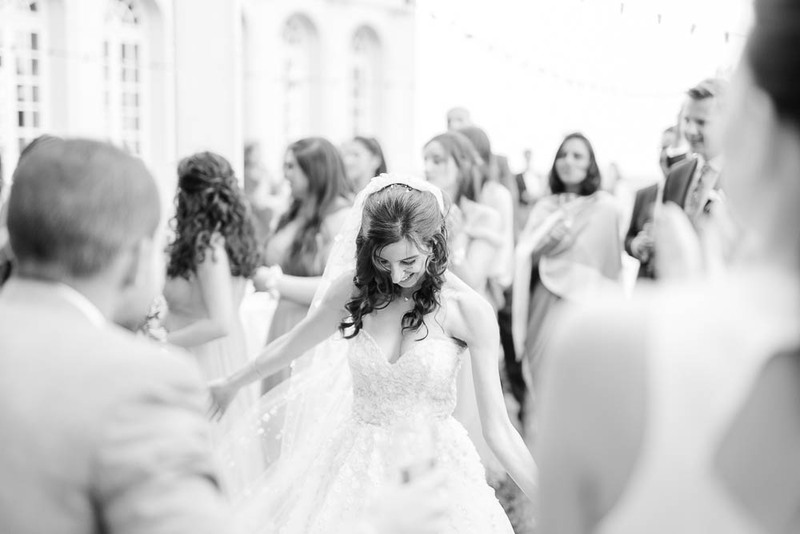 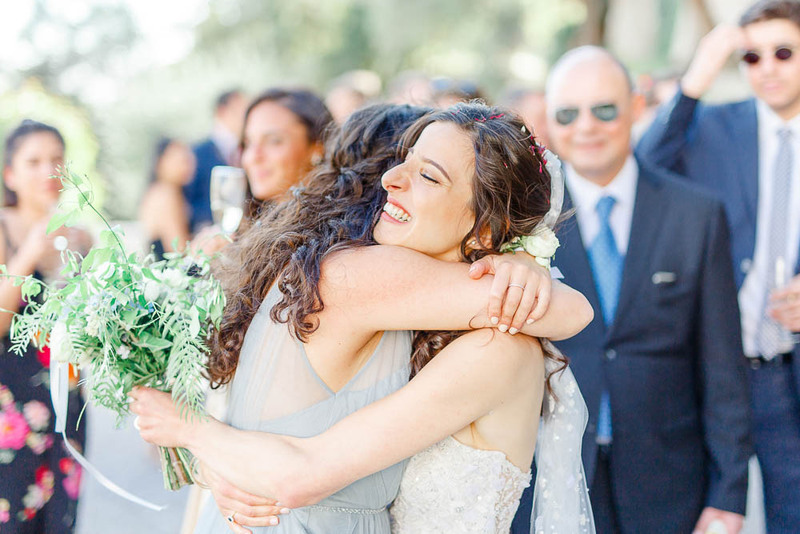 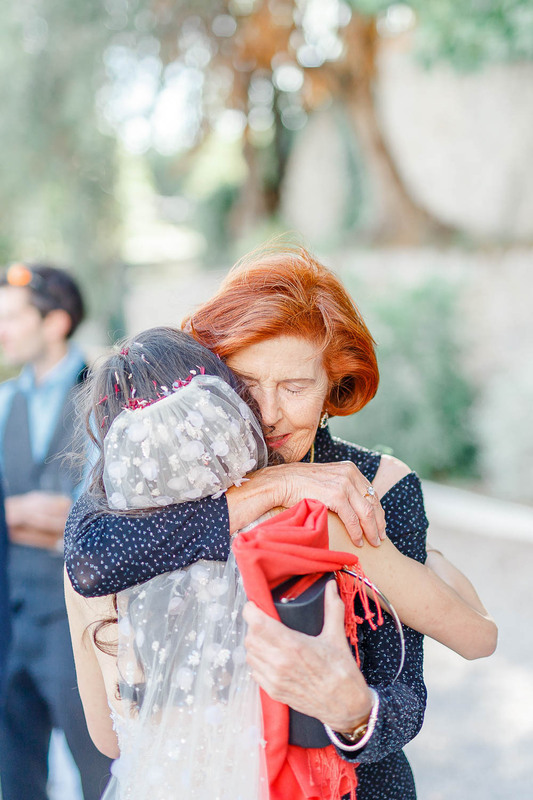 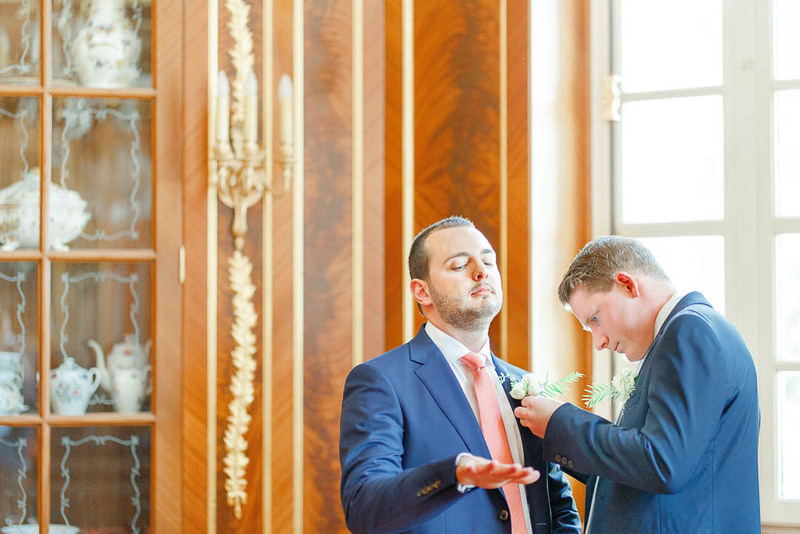 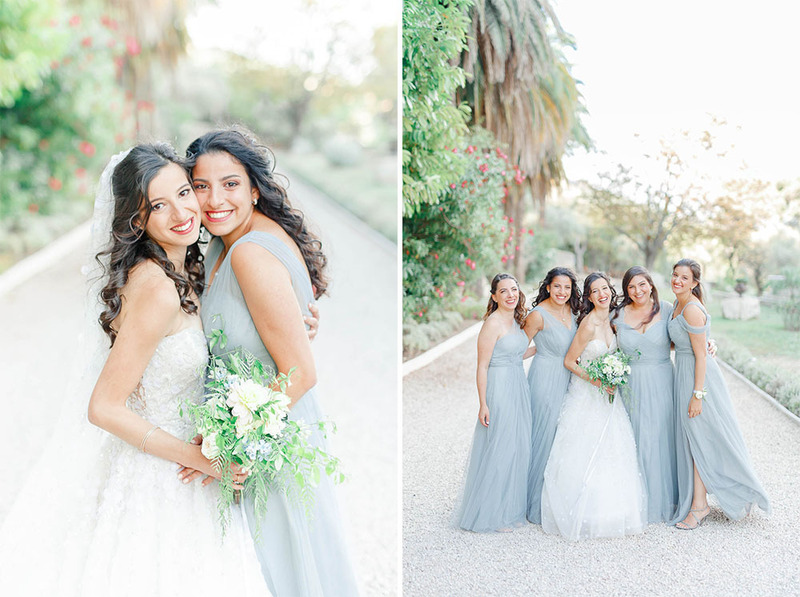 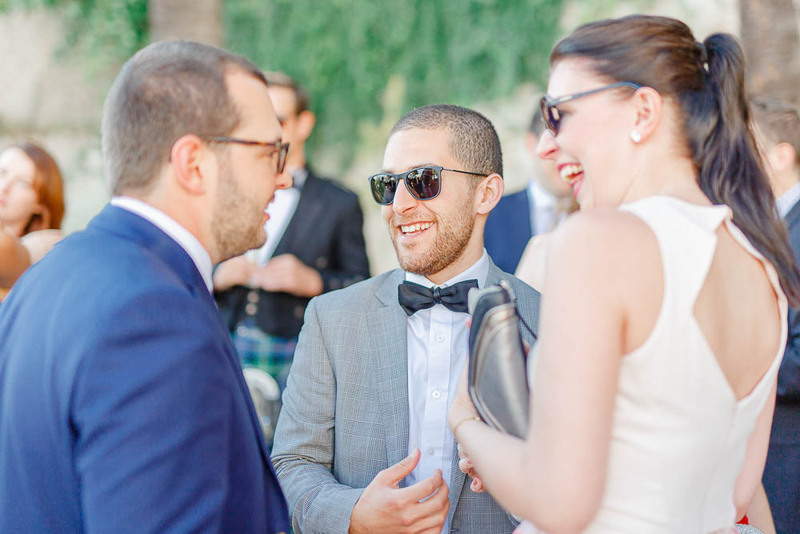 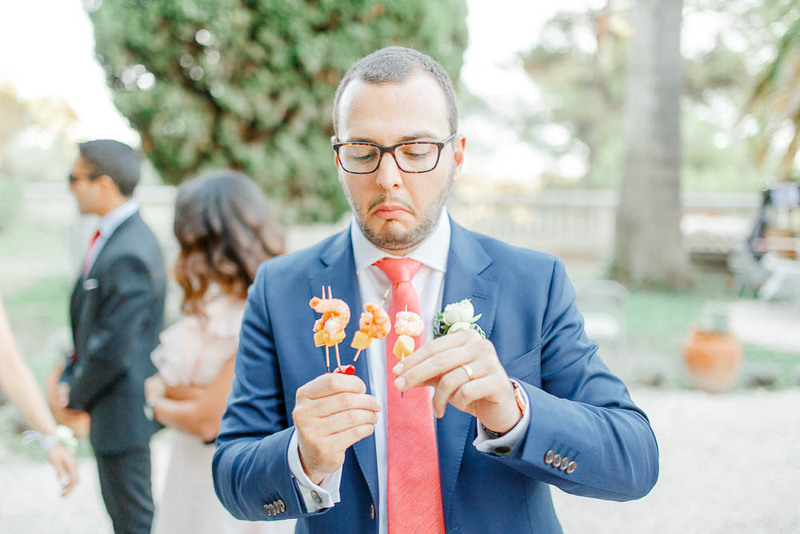 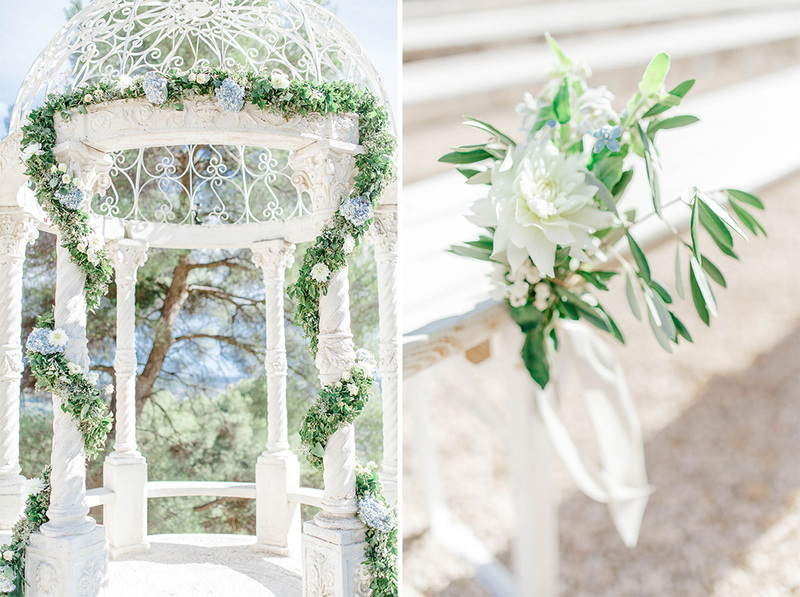 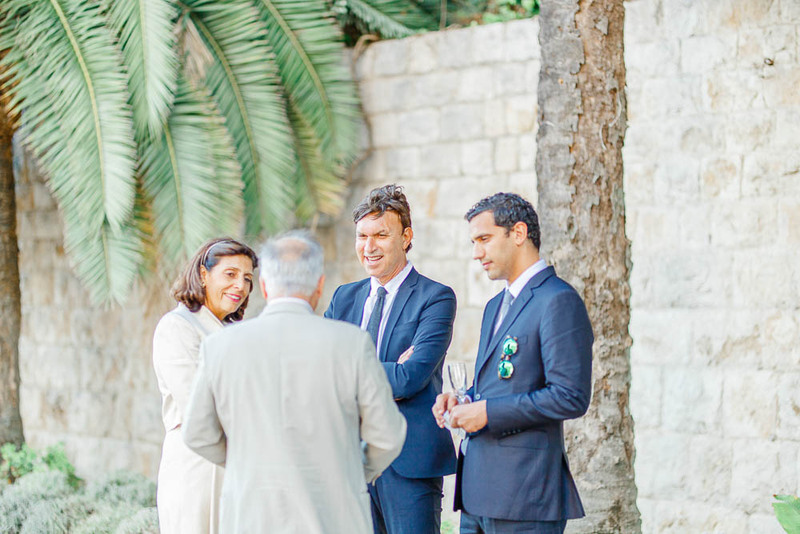 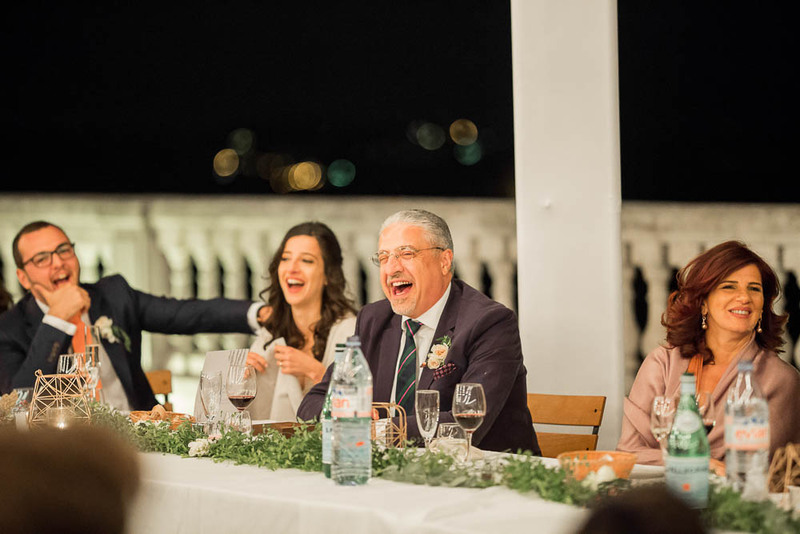 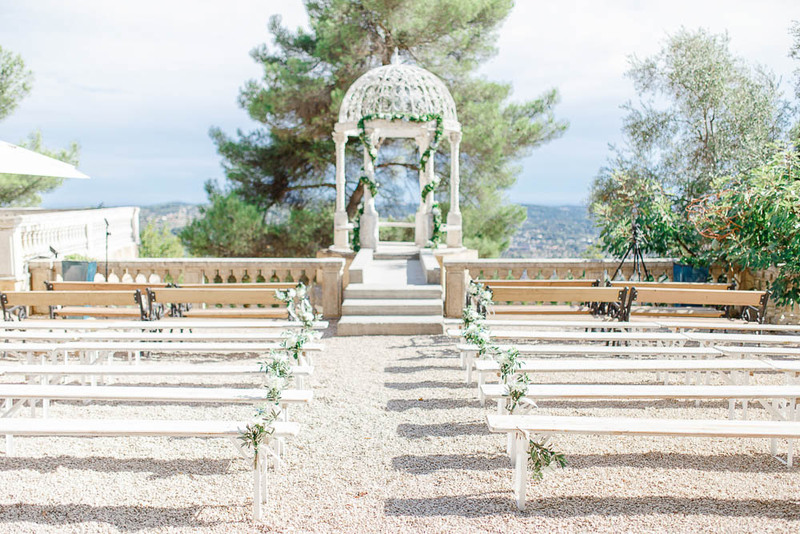 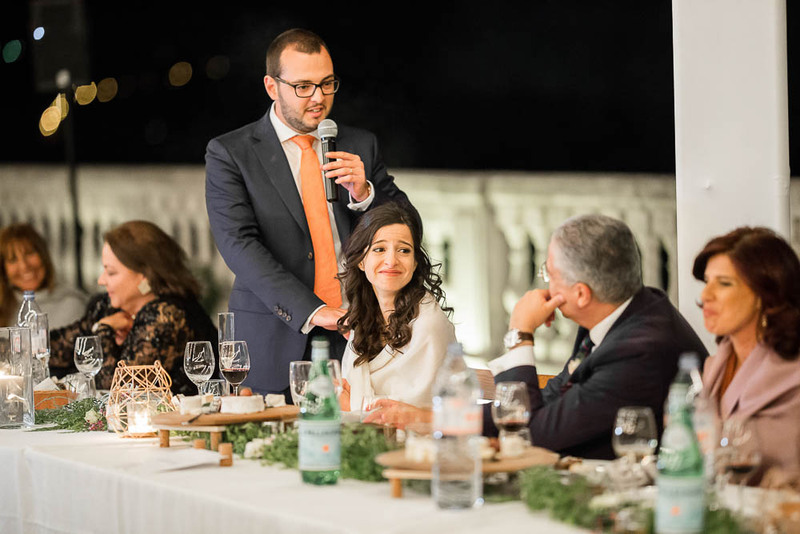 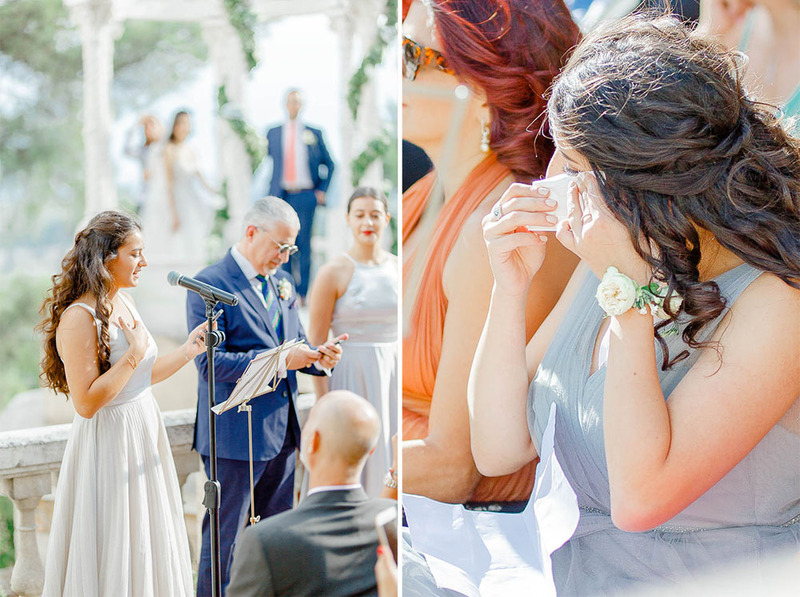 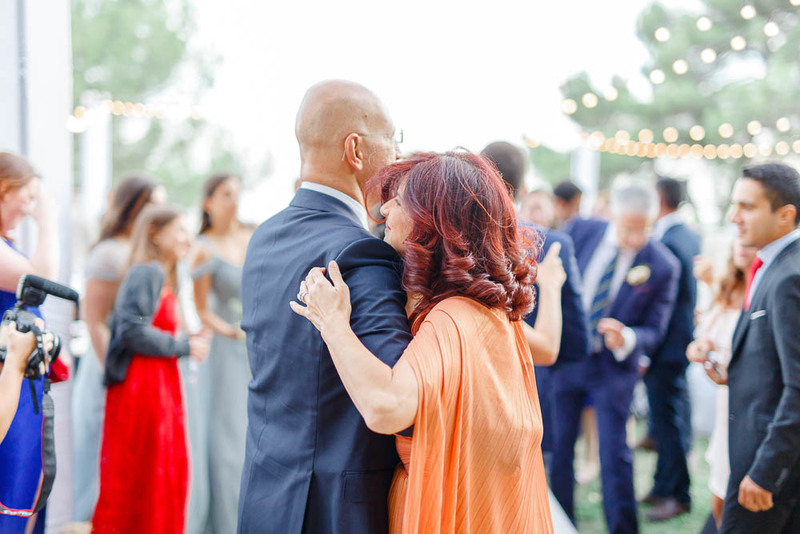 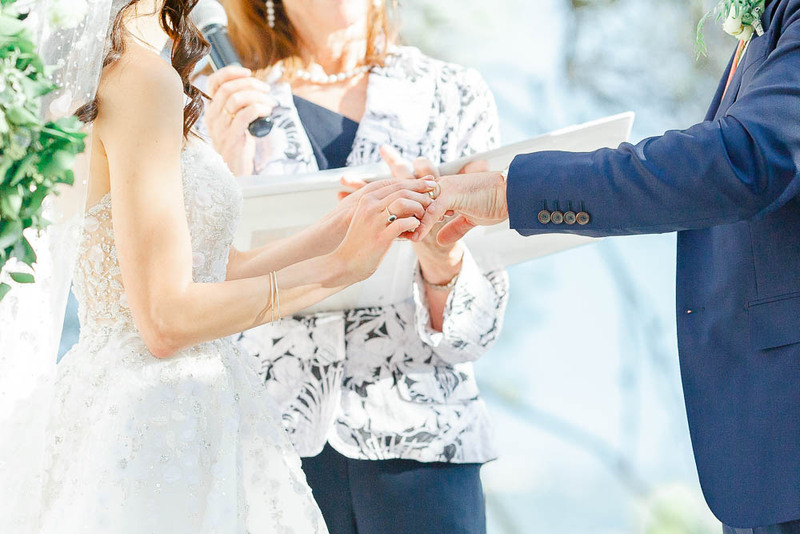 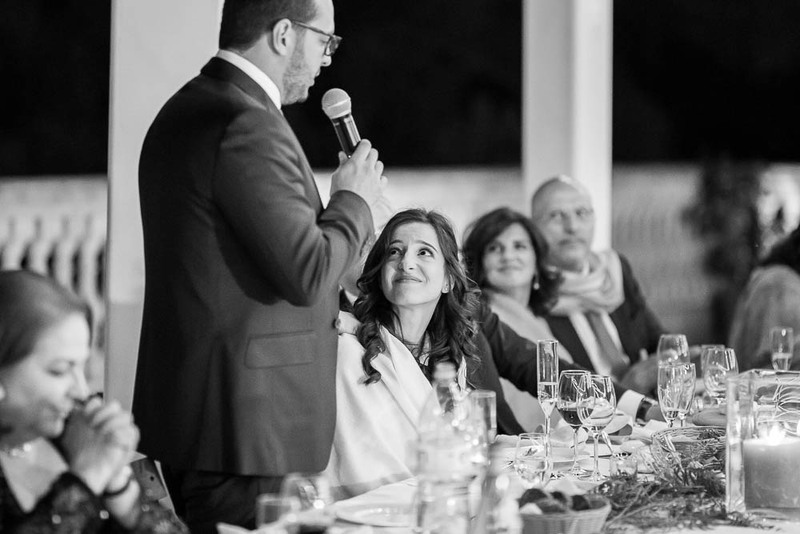 In true French Riviera style the venue was drenched in sunlight all day, meaning that both the ceremony and the wedding breakfast could be held outdoors. 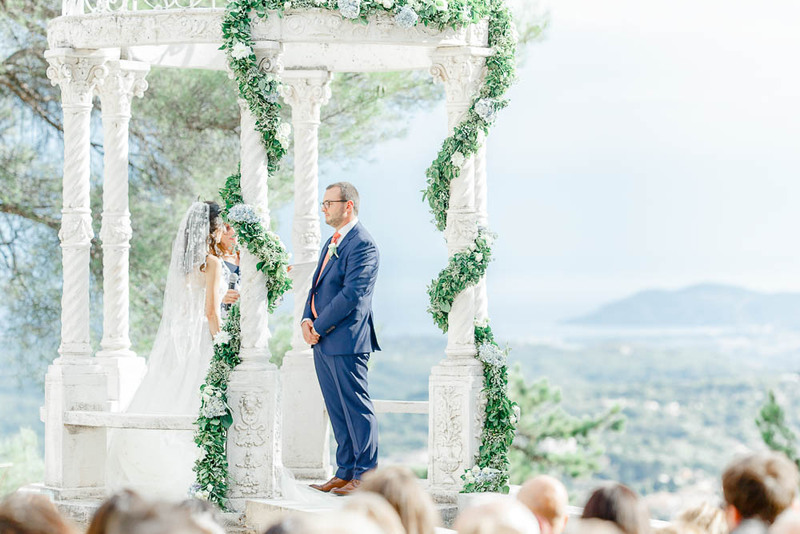 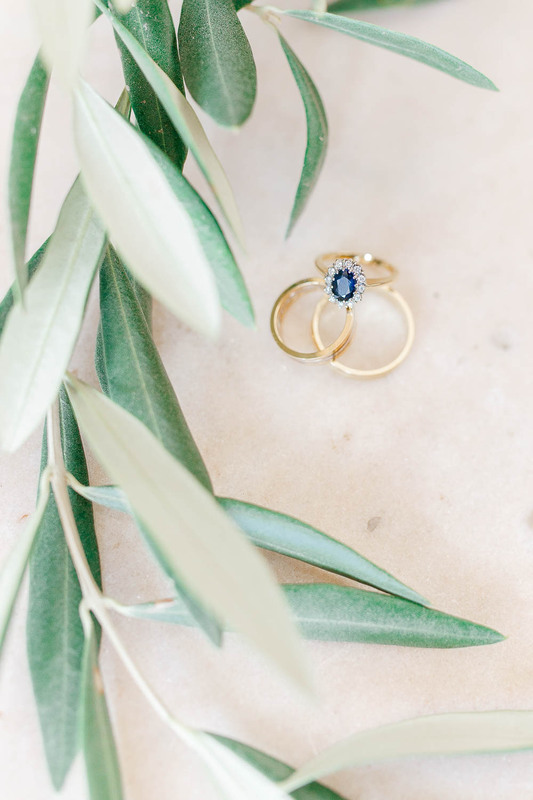 Yasmeena and Ed stood out in the stone ‘temple de l’amour’ to exchange their promises and wedding rings with sea views (it’s certainly not for anyone who’s afraid of heights!). 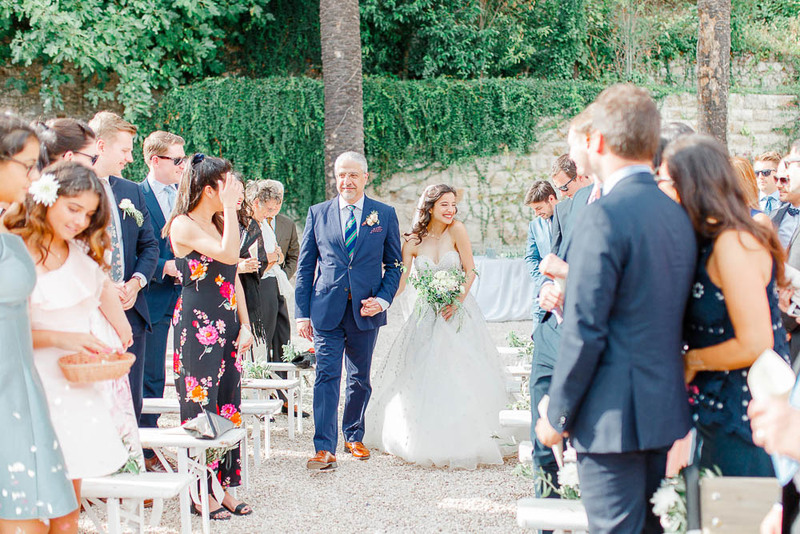 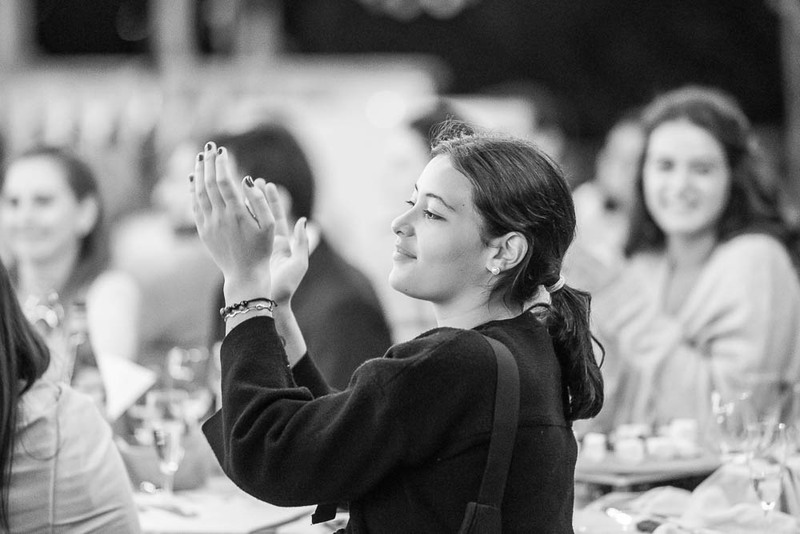 We both felt emotional as we listened to the words of the ceremony conducted by Celia Ford Drummond, and looking around at the guests we weren’t the only ones! 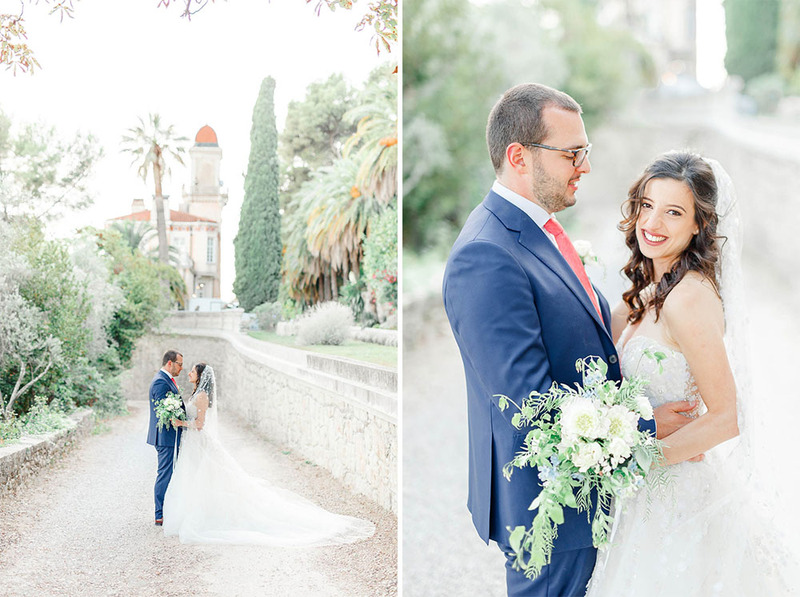 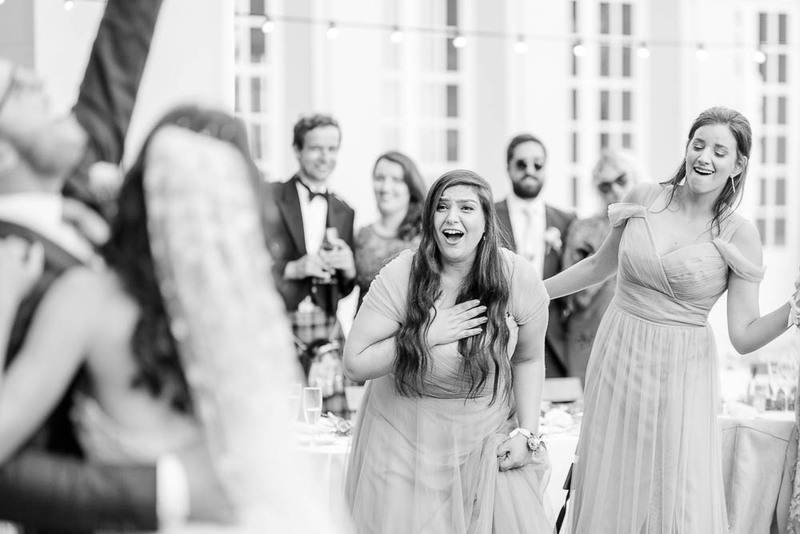 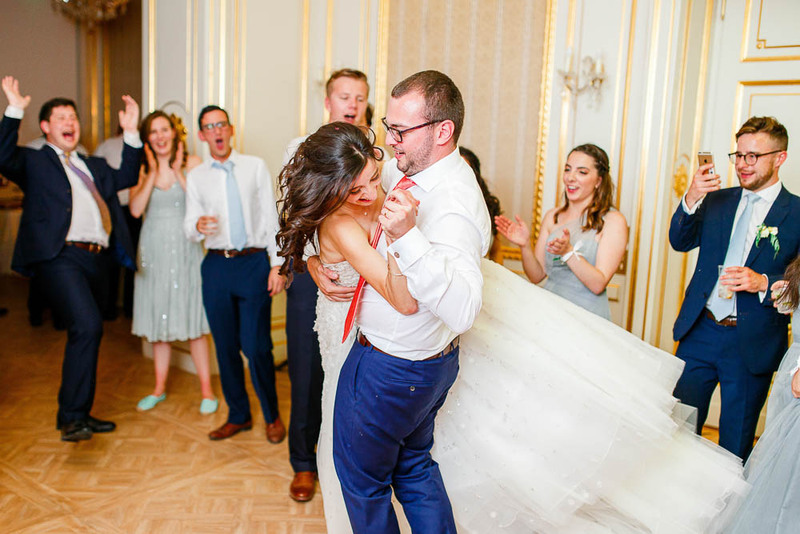 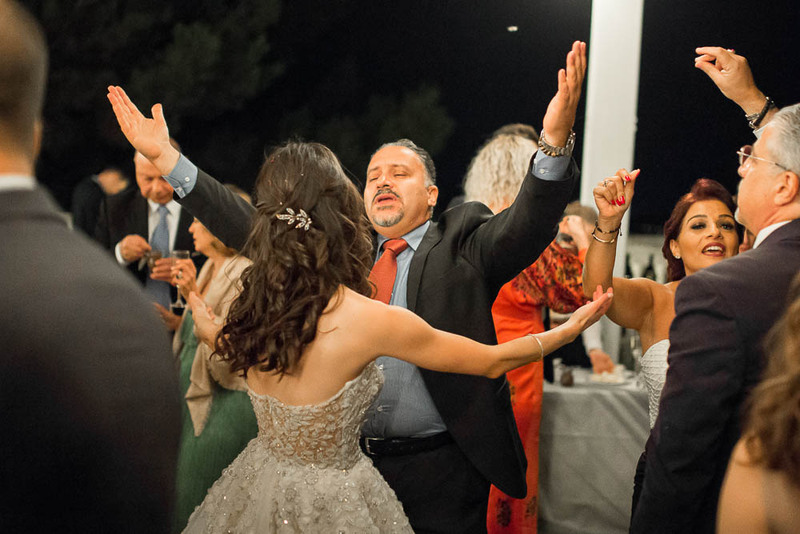 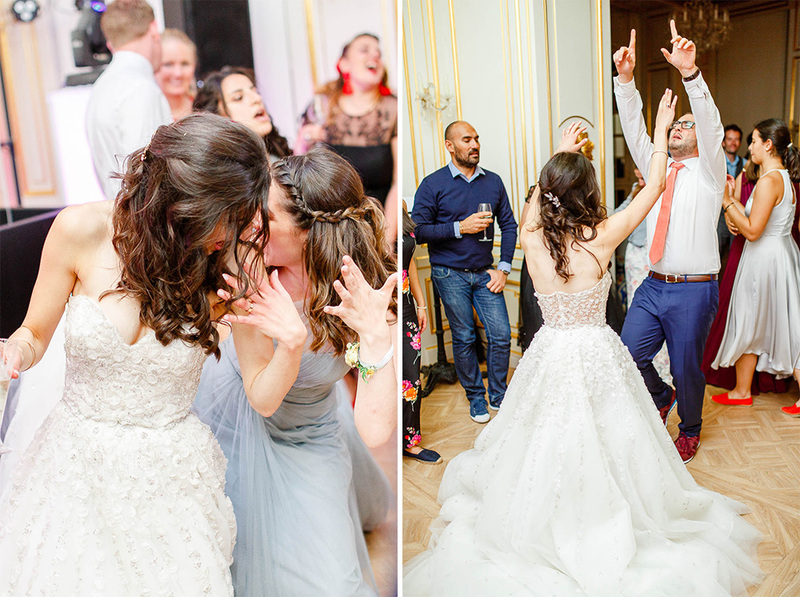 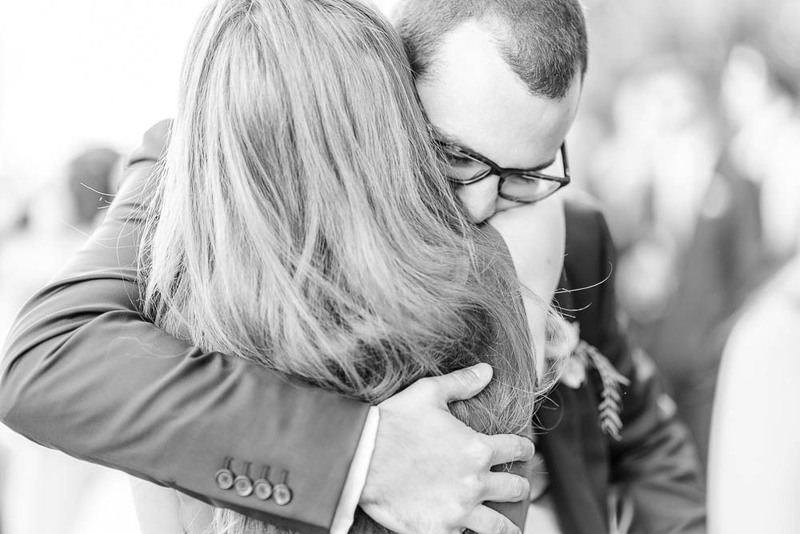 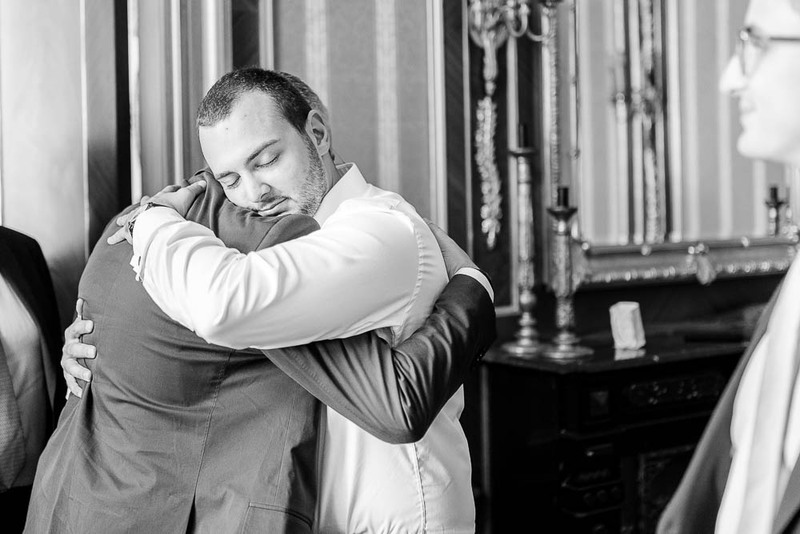 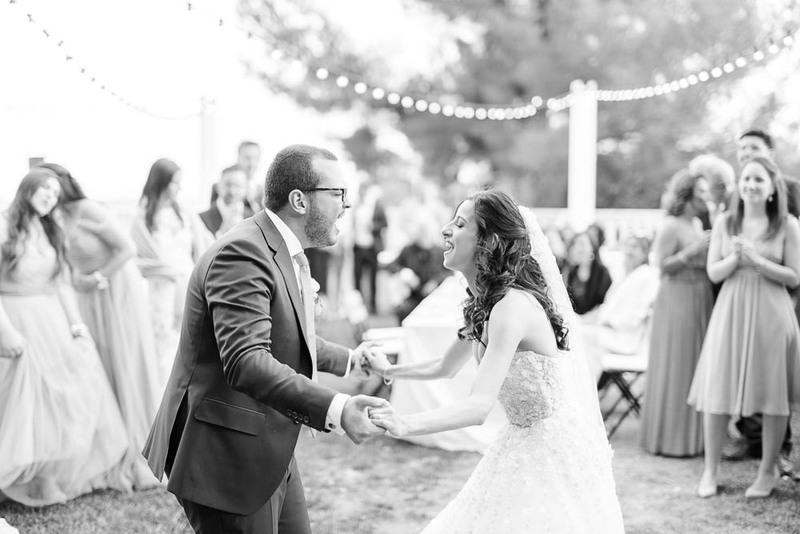 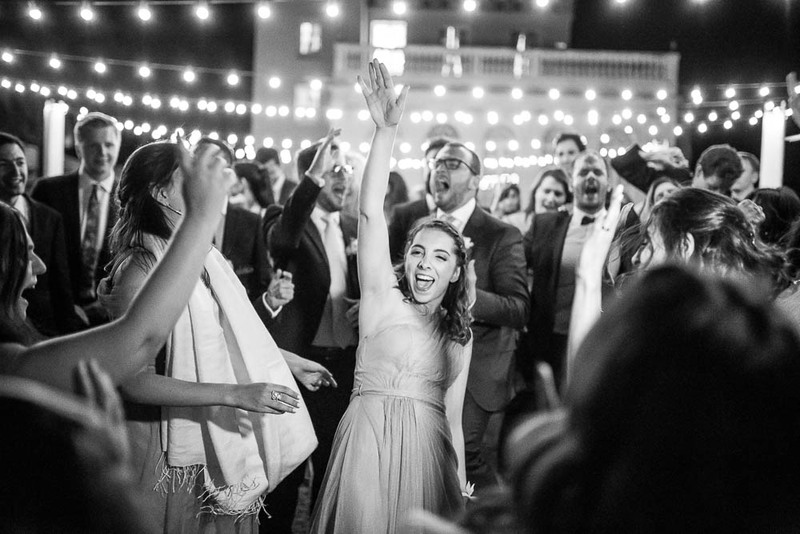 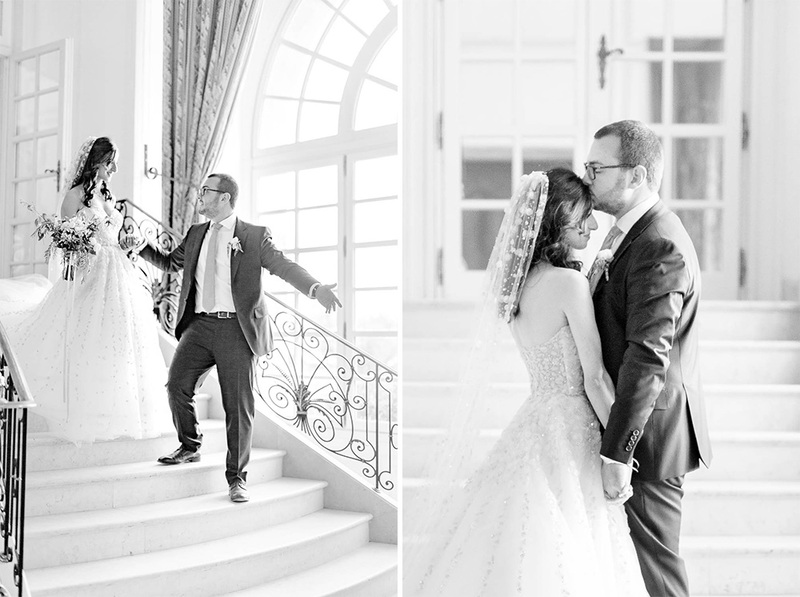 Yasmeena and Ed are clearly so in love, and it was wonderful to see their day coming together for them just as they had hoped. 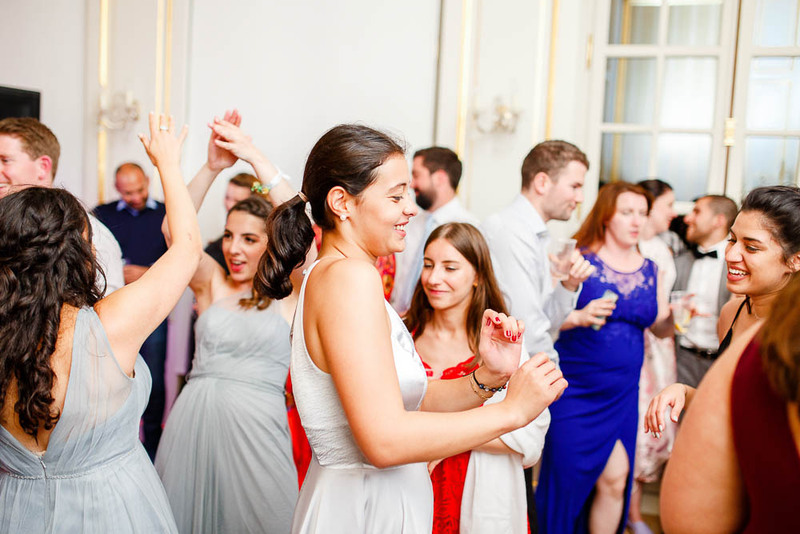 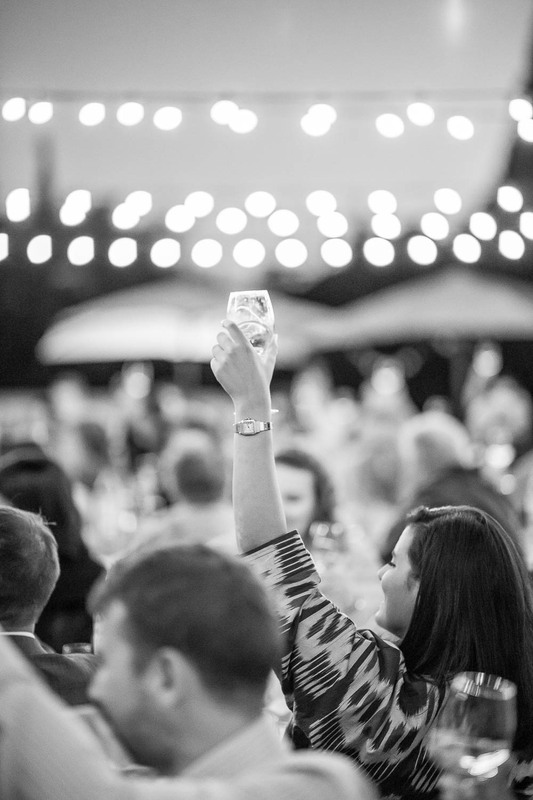 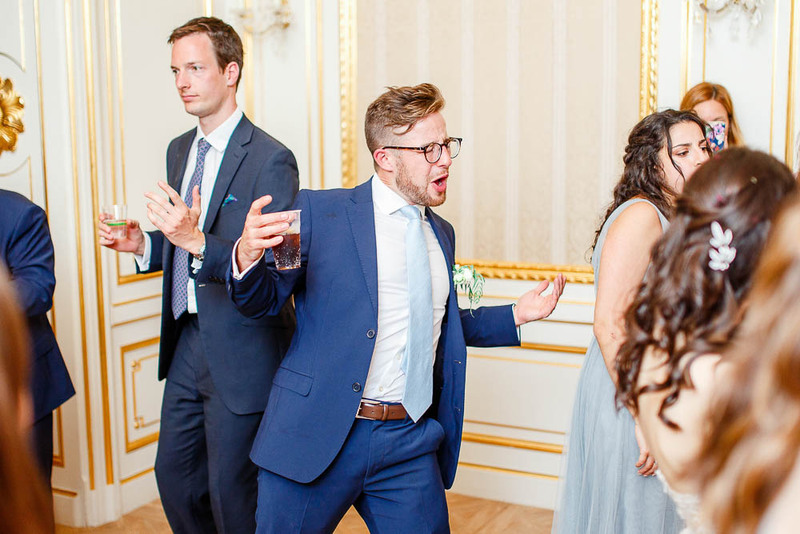 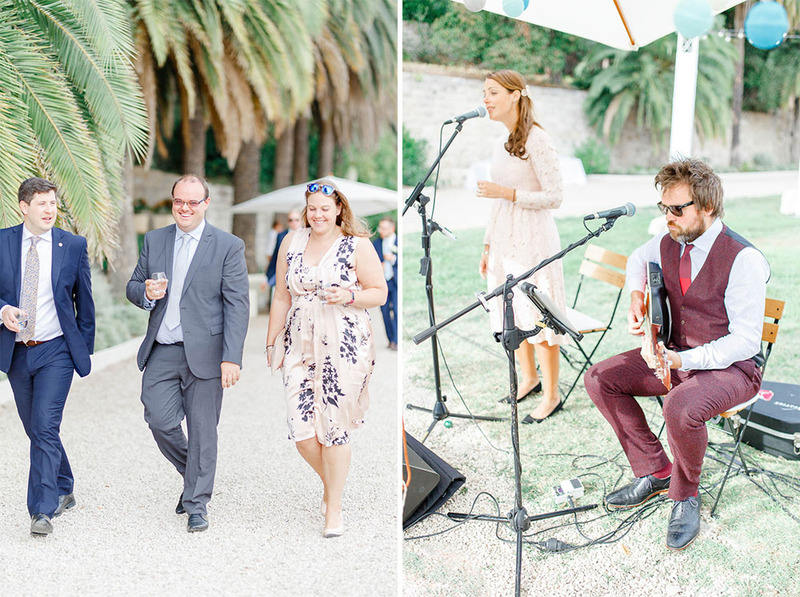 The newlyweds and guests gathered for a drinks reception out on the terrace, and were treated to some fabulous live music by Lizzy & the Gentlemen. 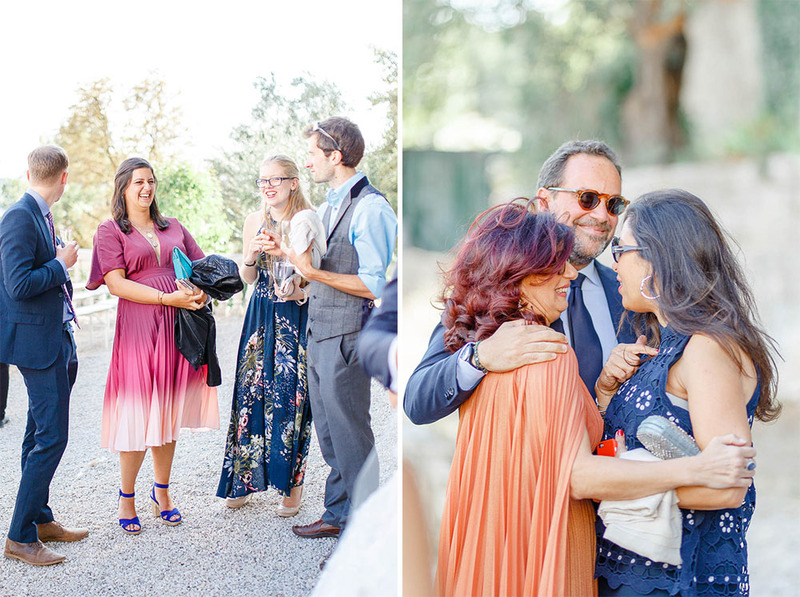 After some time for photos everyone made their way to the wedding breakfast space to eat at long, banquet-style tables. 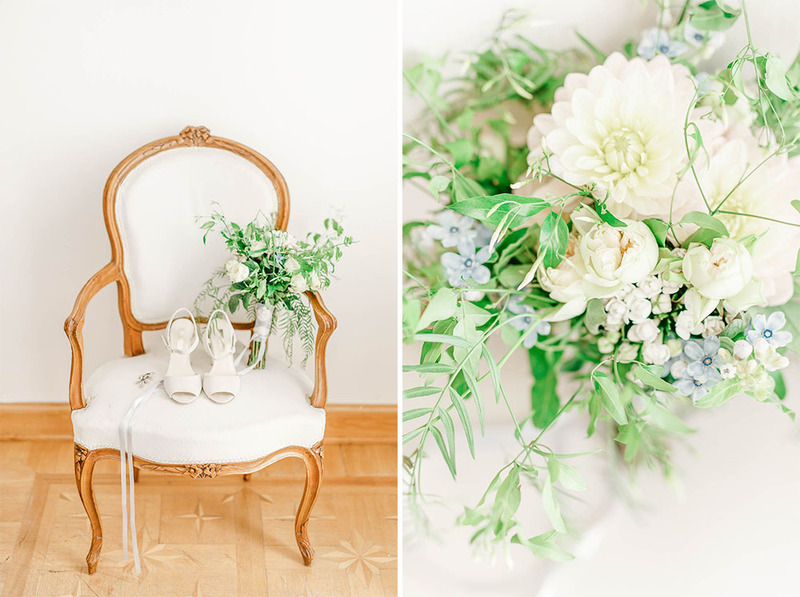 These were adorned with fresh flowers by Maud Creation Florale (loved the dahlias!) 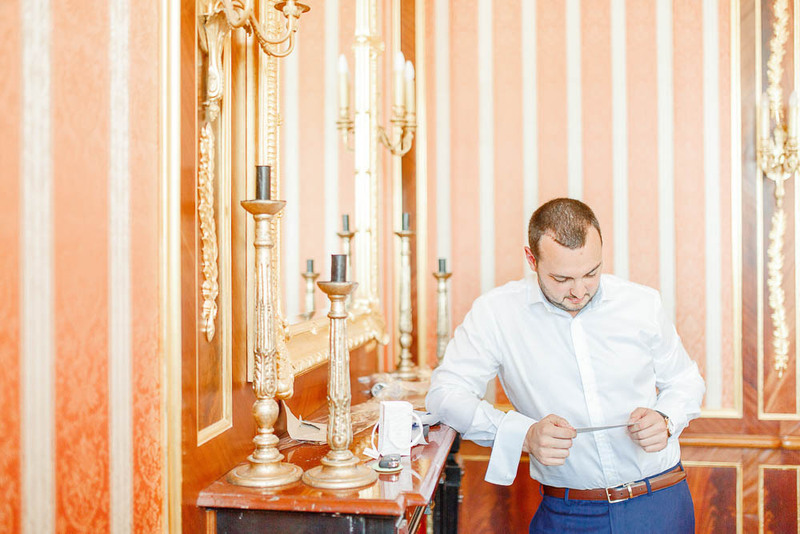 and geometric hurricane lamps. 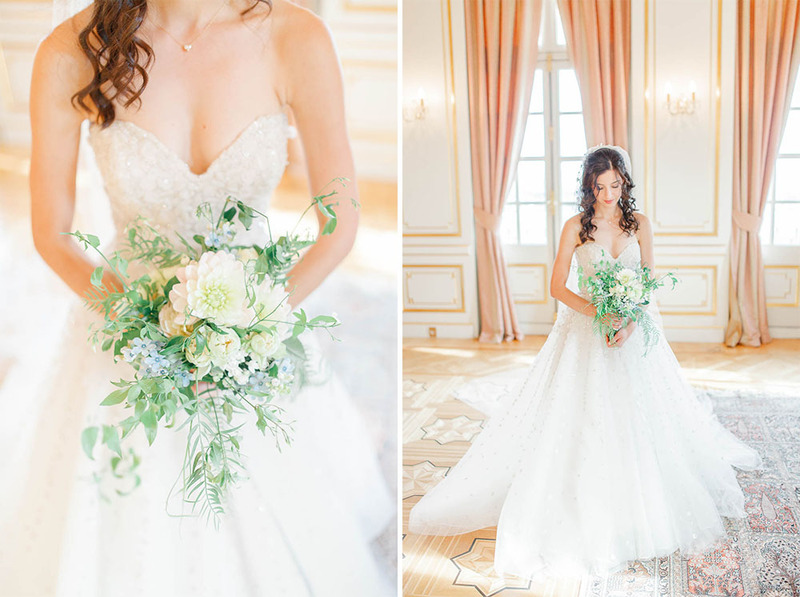 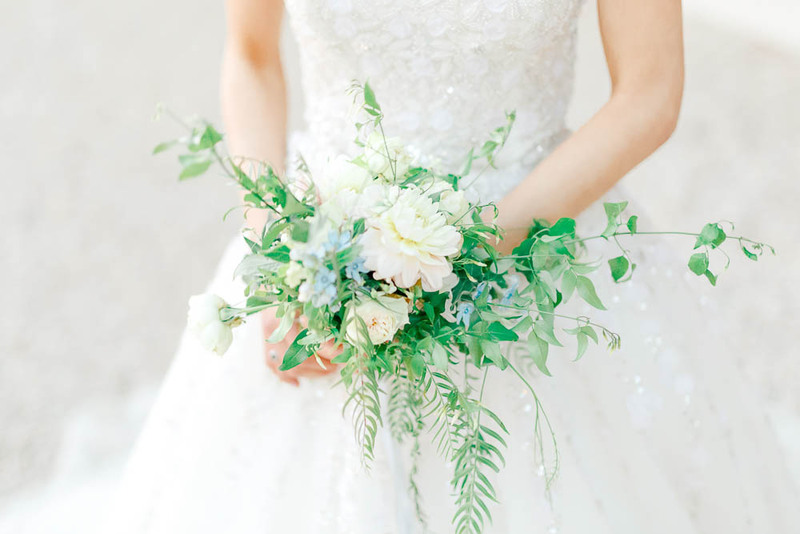 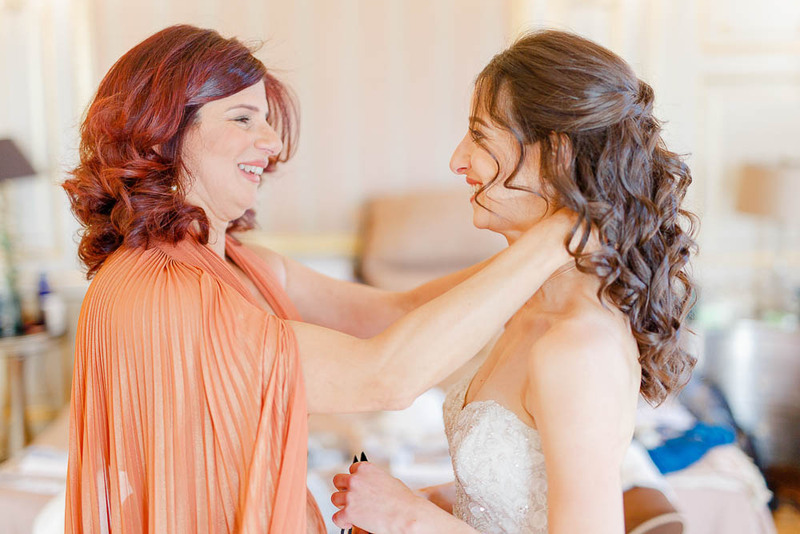 The bridal bouquet was so delicate, and the florist even managed to tuck some of Yasmeena’s namesake jasmine in there. 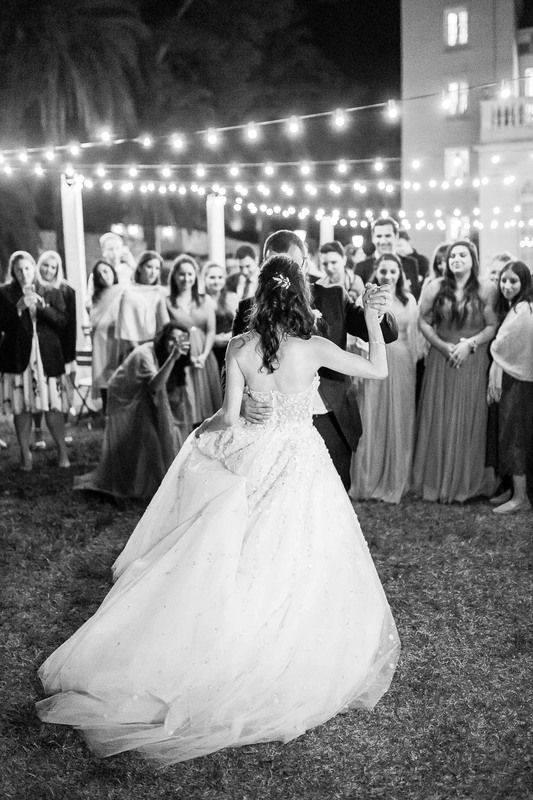 As dusk fell the strings of festoon lights were lit above the terrace, creating an incredibly romantic glow for the outdoor first dance. 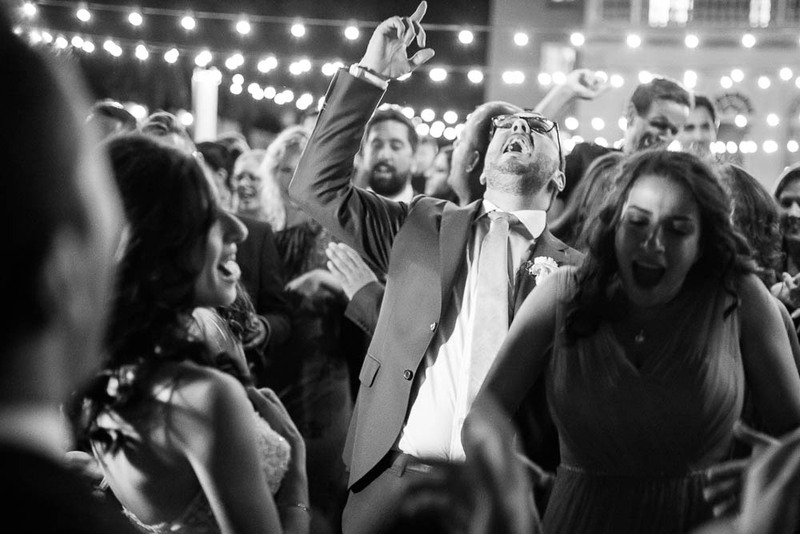 Thomas Dusseune was DJing and kept everyone up on the dancefloor, moving inside once it got too chilly! 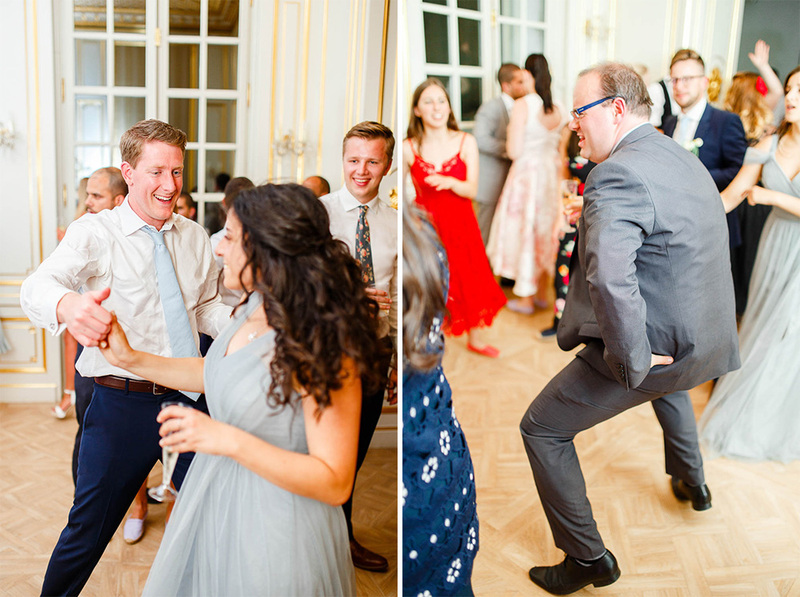 We honestly couldn’t have asked for a more fun, sweet group of people to spend a day with (and undeniably great dancers too!). 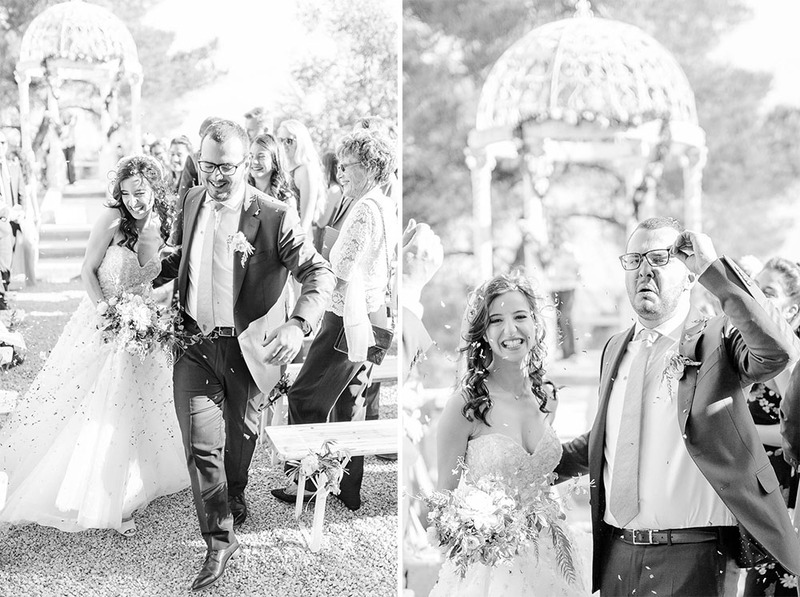 Being part of a day so special and beautiful was an absolute privilege, and our cheeks ached from smiling by the time we left. 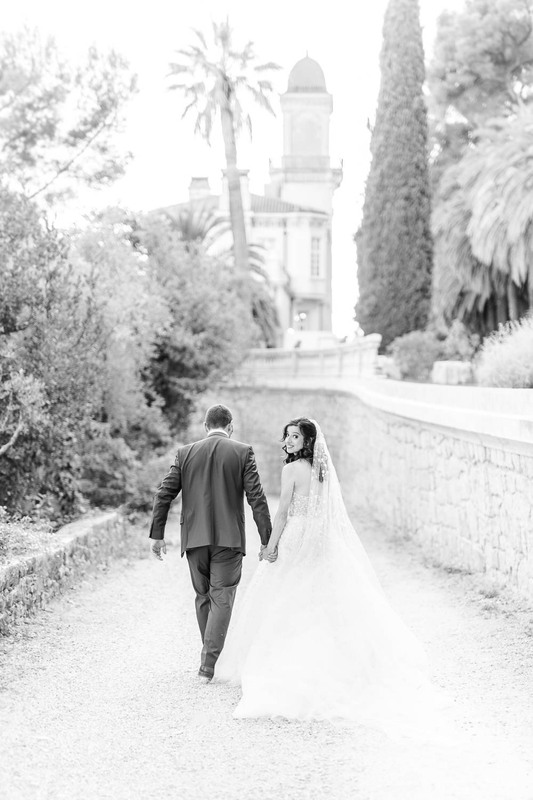 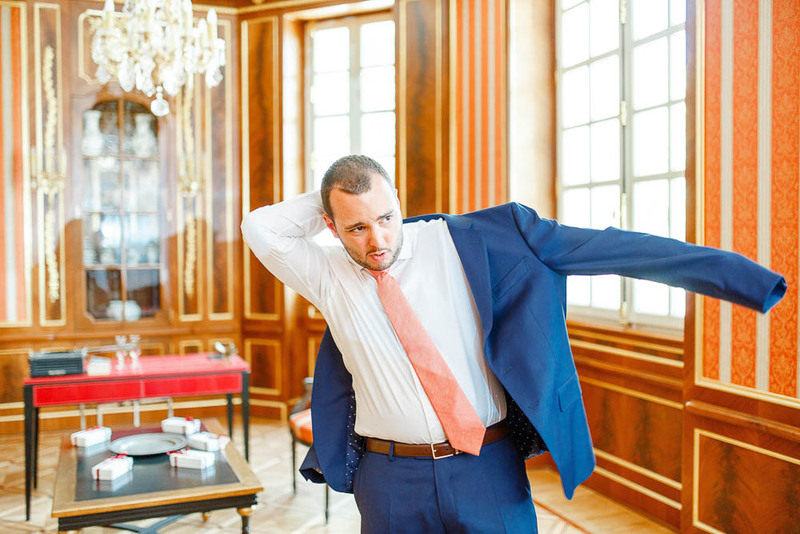 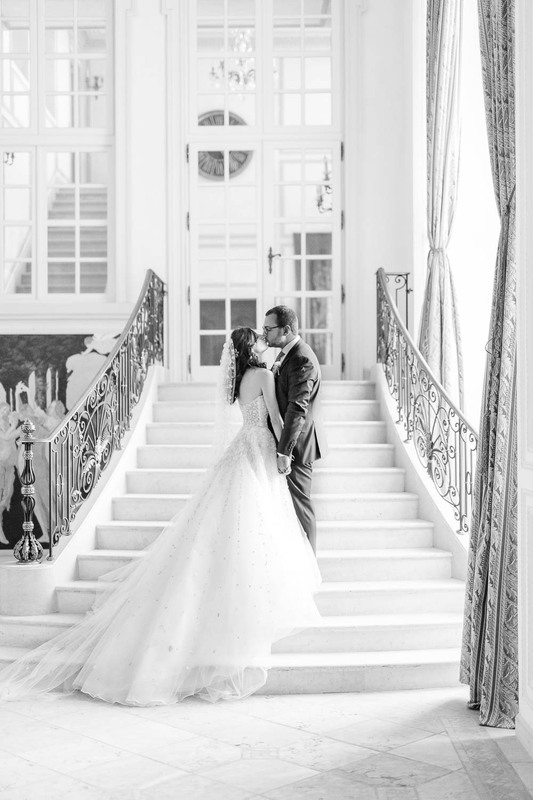 Yasmeena & Ed – we wish you all the love and happiness in the world!